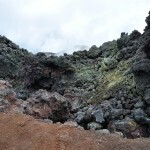 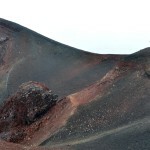 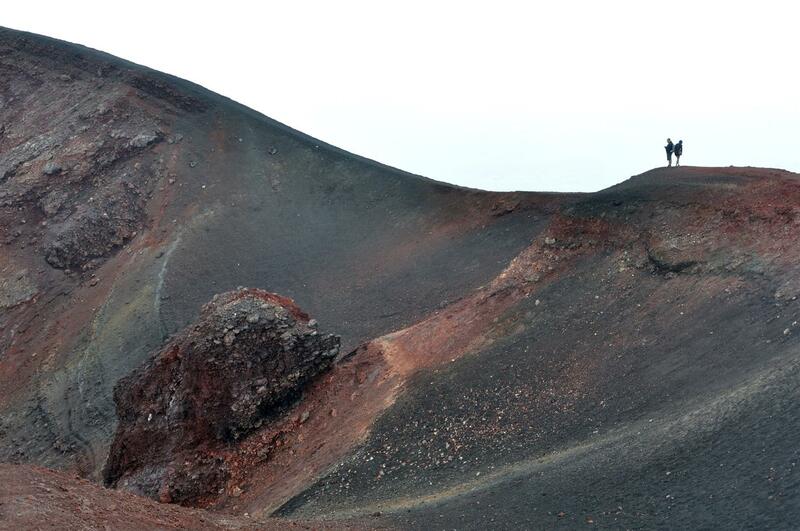 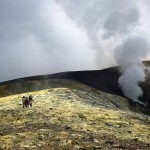 Etna Summit Craters. 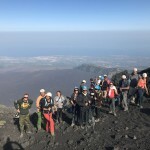 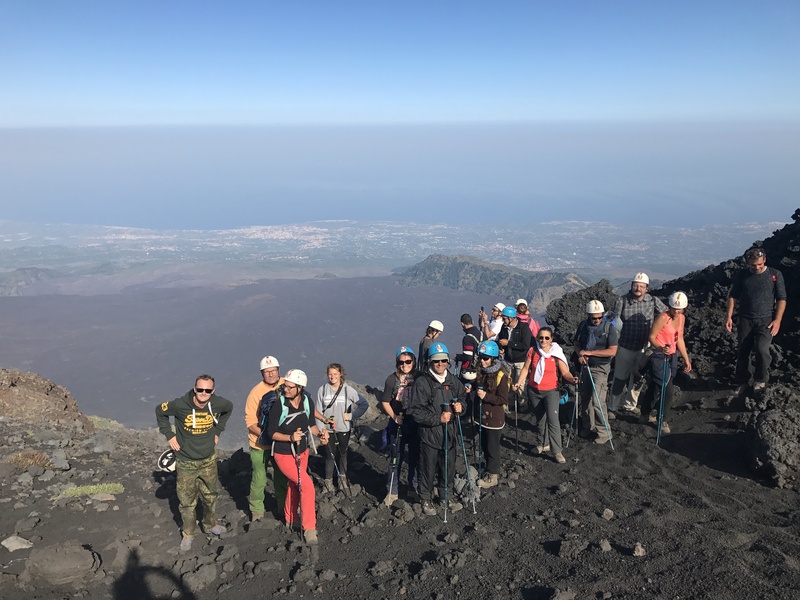 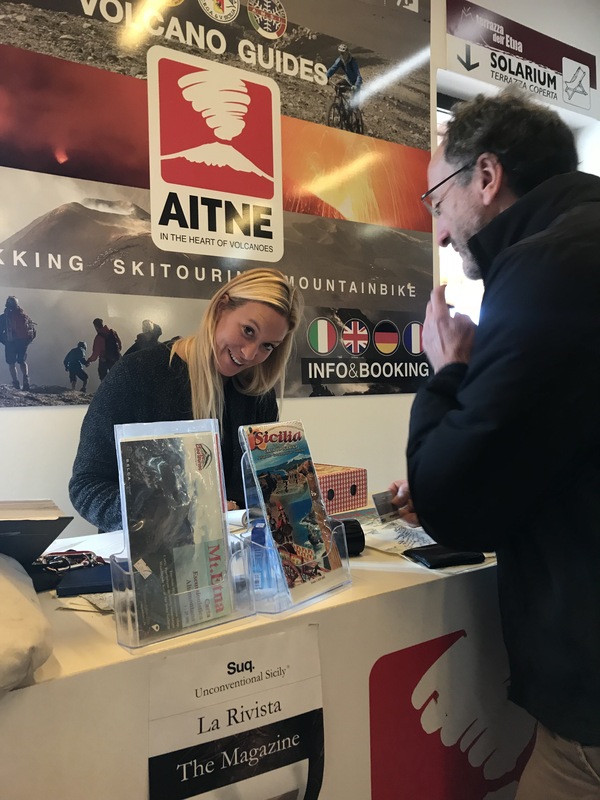 Start from meeting point at 9:15am in “Terrazza dell’Etna” restaurant on Etna South – € 85.00 adults and € 75.00 children 7-12 years old (€ 80.00 adults and € 70.00 children, with Hotel Corsaro Special Guest Card), duration about 5h 30m – Information www.aitnemed.com – Phone numbers: Booking +39 3394802186 – Marco Tomasello +39 3470800902 – Francesco Ciancitto +39 3206497278 – Marco Di Bella +39 3408393241 – Book in advance. 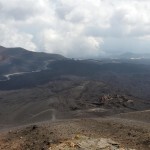 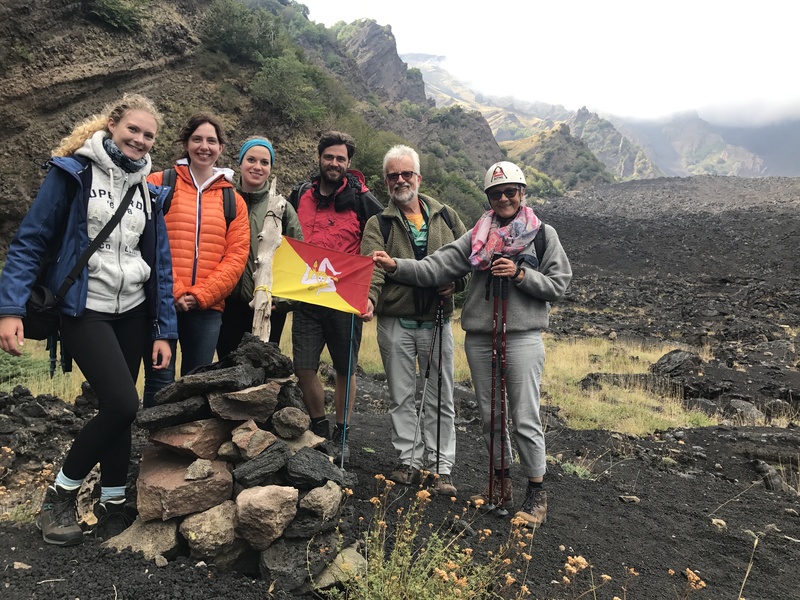 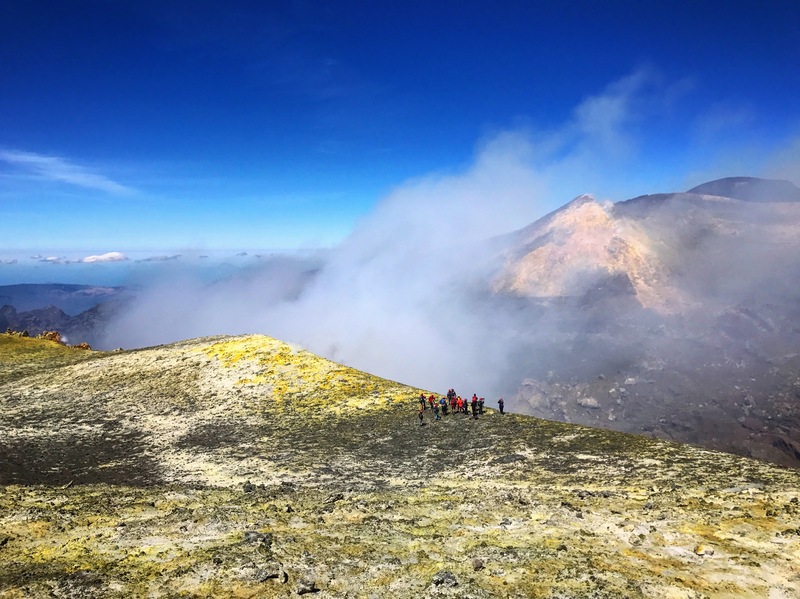 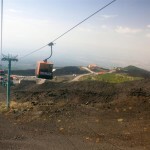 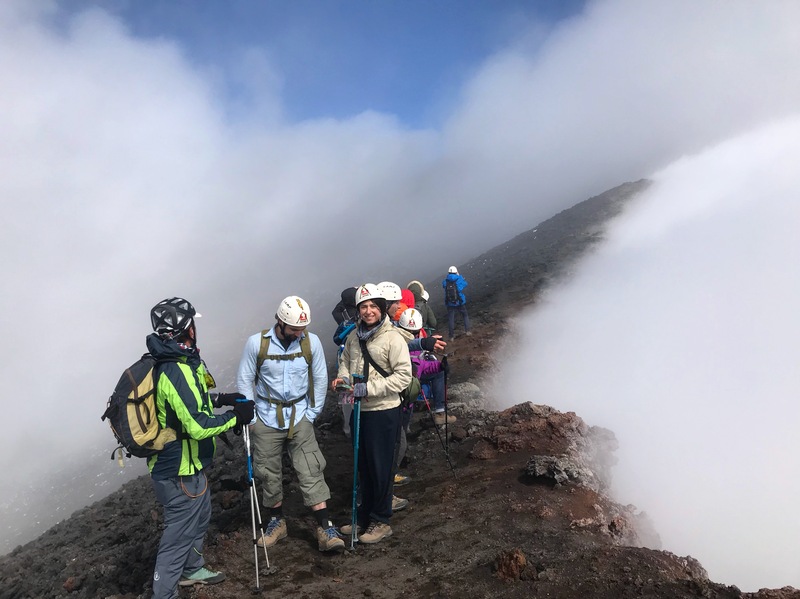 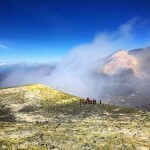 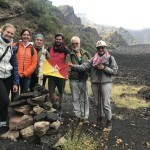 The excursion starts after taking the cabin and the off-road vehicles to reach 2900m a.s.l.. From the area of “Torre del Filosofo” we will walk around the edge of the Central Crater from west and we will go up to 3260m a.s.l., where we can see the impressive depression of Bocca Nuova crater, maybe the most spectacular summit crater. 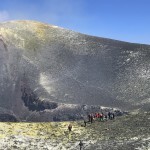 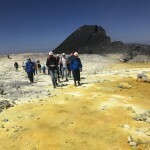 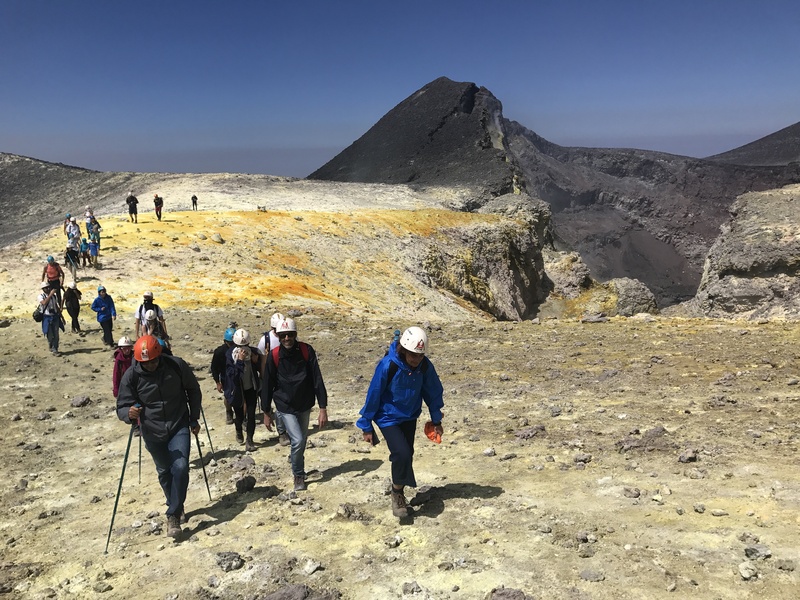 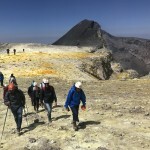 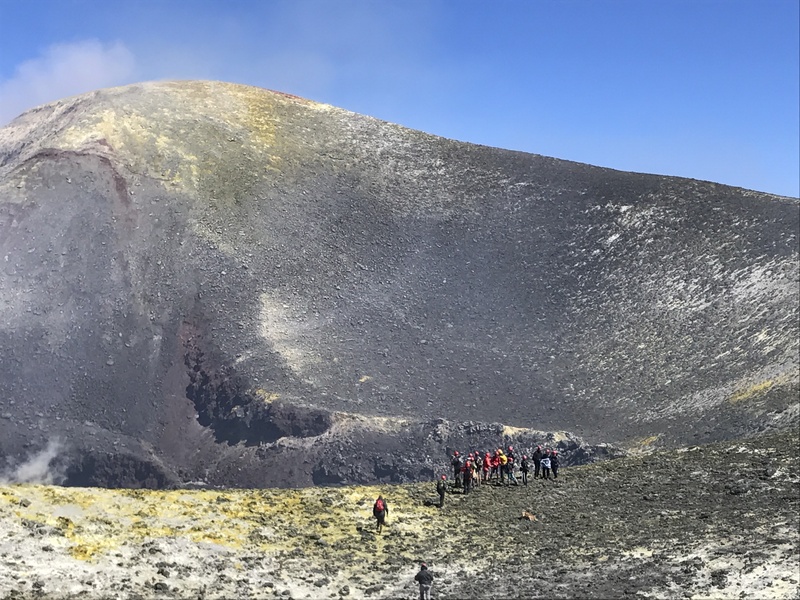 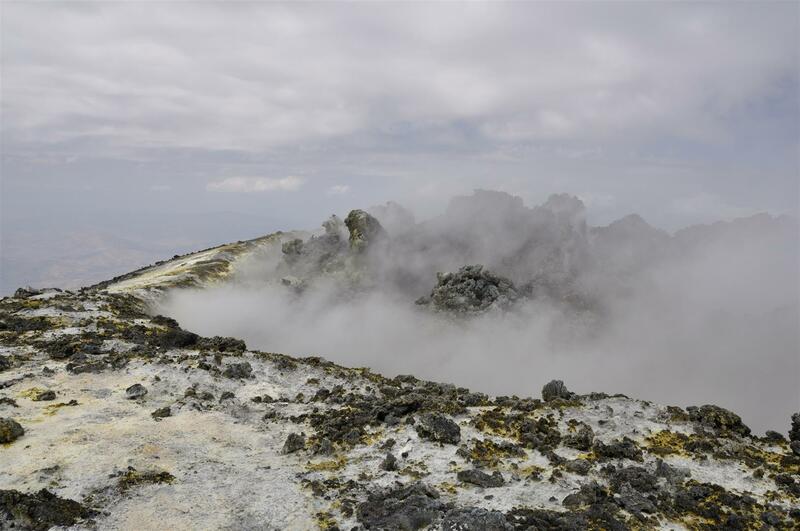 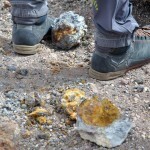 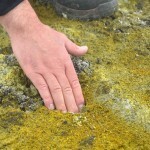 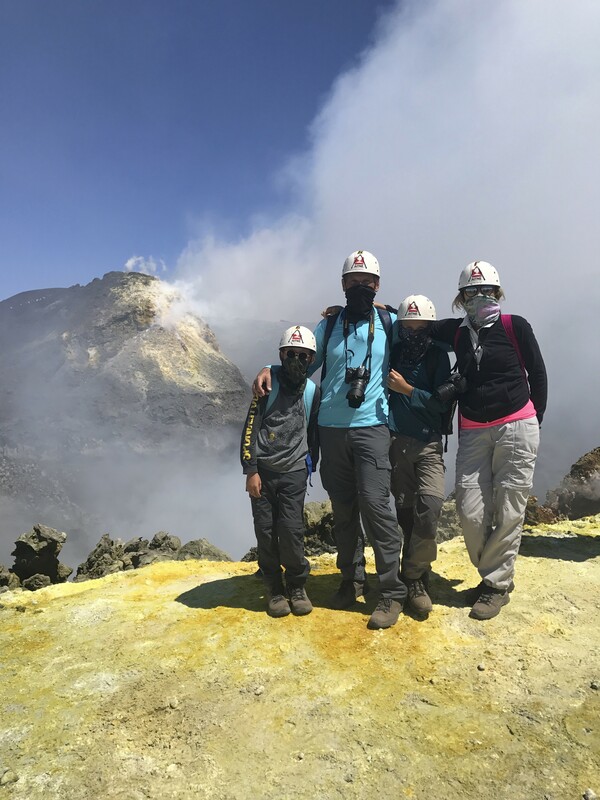 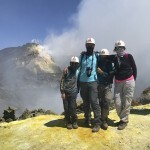 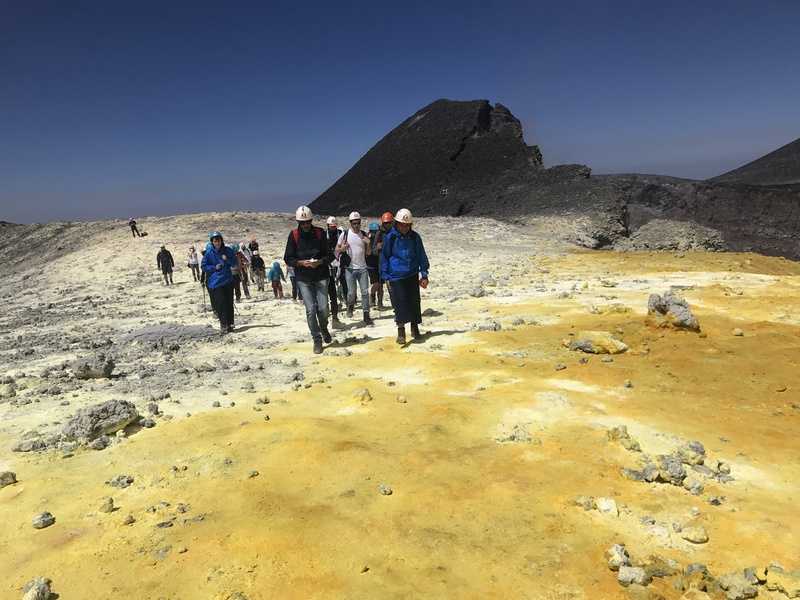 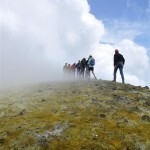 According to the wind direction and volcano activity, we will visit the Voragine crater with its glowing pit crater and we will reach the top of the volcano at 3329 m a.s.l., the Nordest Crater. 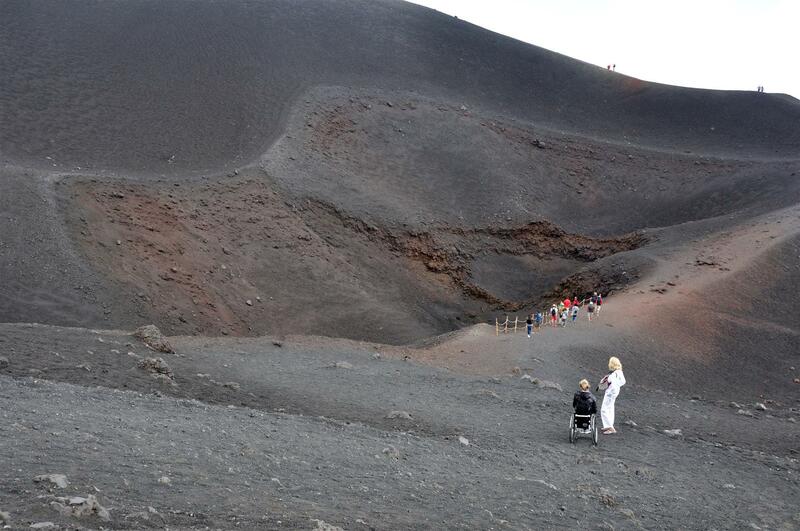 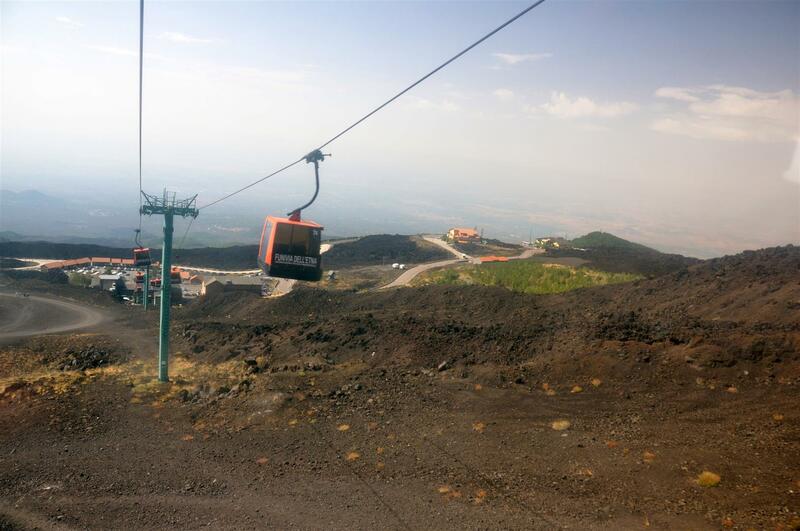 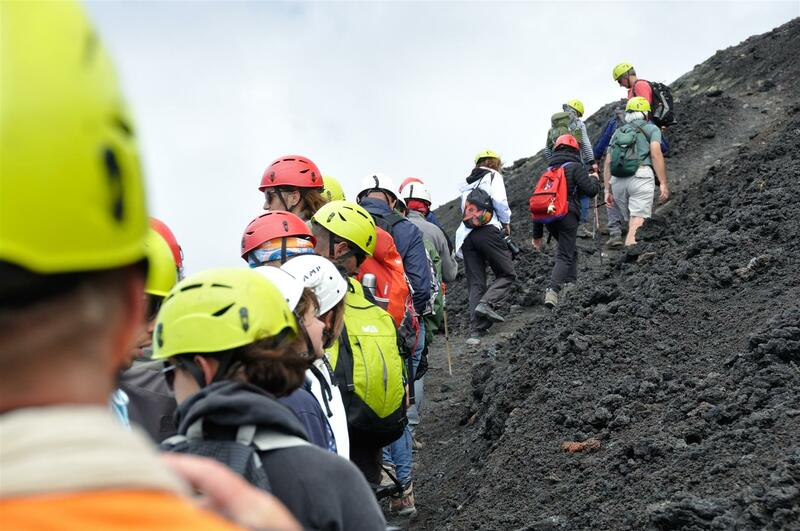 The descent will take place on a comfortable slope covered with soft volcanic ash that will bring us quickly to the theatre of the eruption that took place in 2002-2003, and to see Valle del Bove (at 2500m a.s.l. 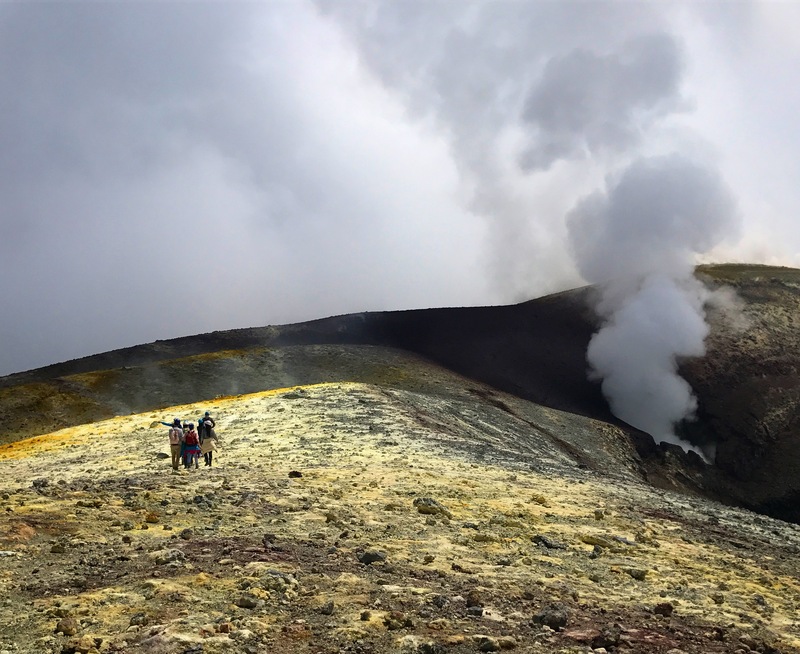 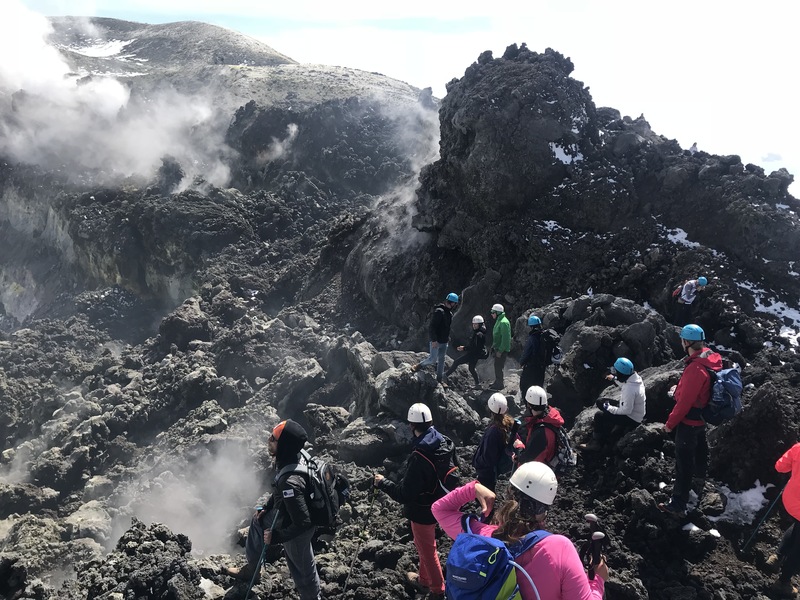 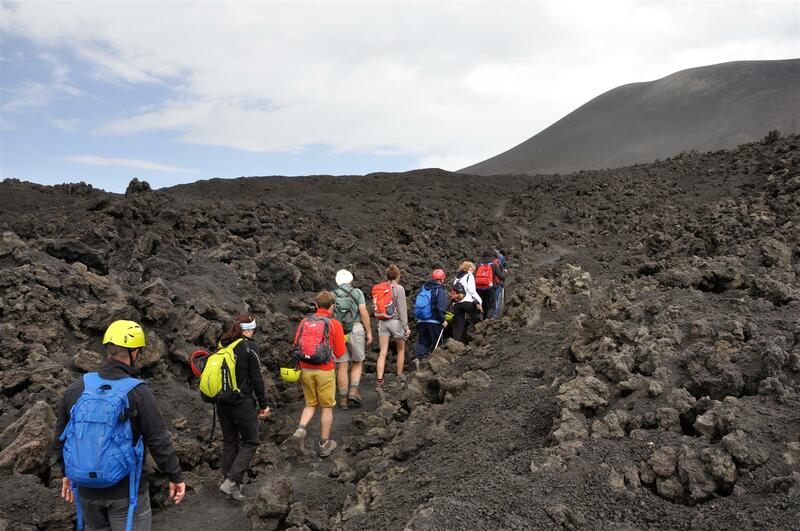 altitude), an enormous caldera succession of ancient eruptive centres; then we will go back down by cabin towards the square of Rifugio Sapienza. 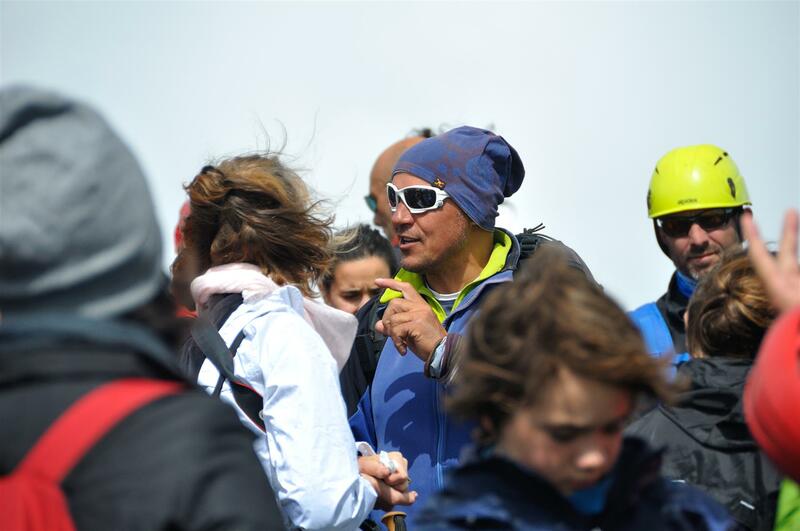 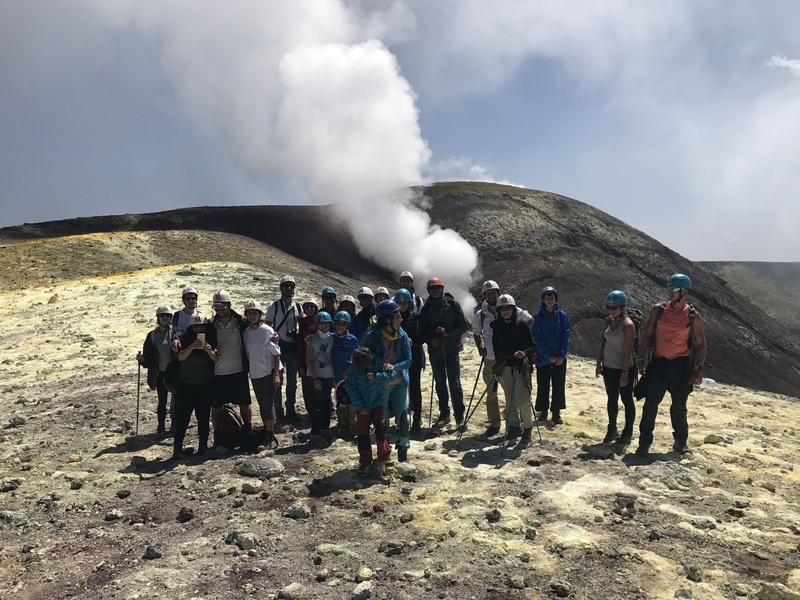 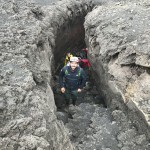 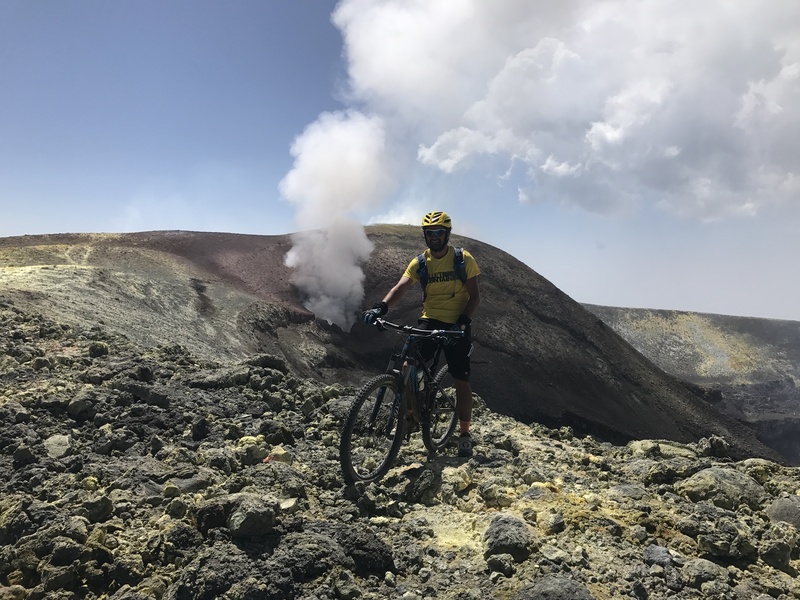 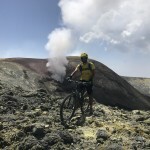 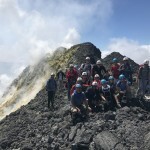 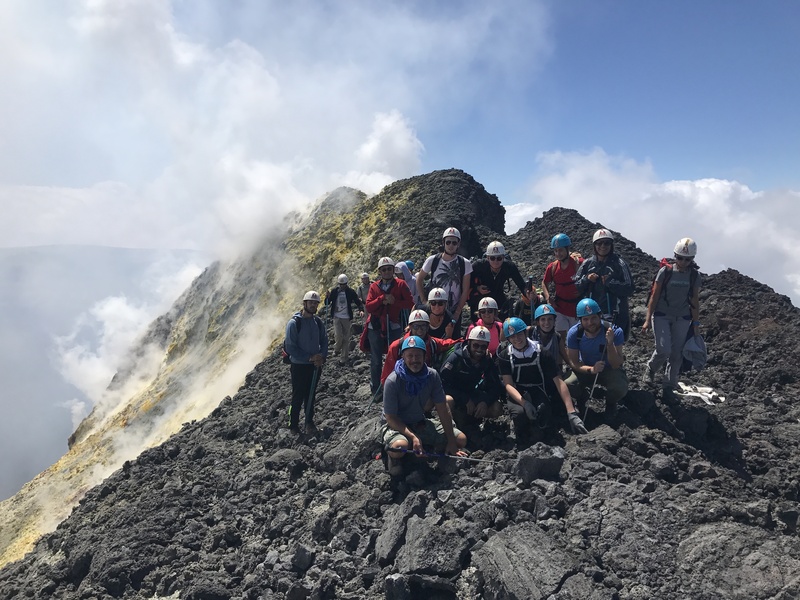 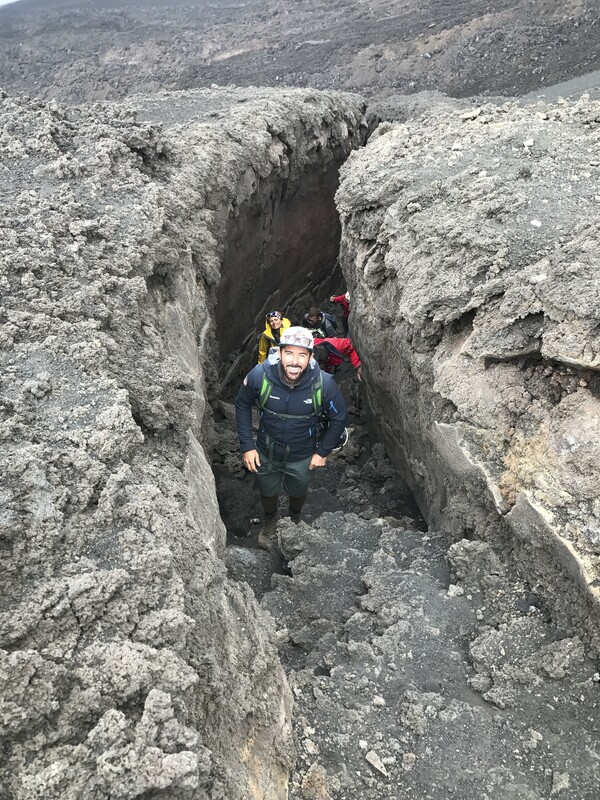 Technical data : 450m uphill, 700 m downhill, rocky and sandy terrain (scoria and volcanic ash); duration of 5 ÷ 6 hours according to the group’s pace. 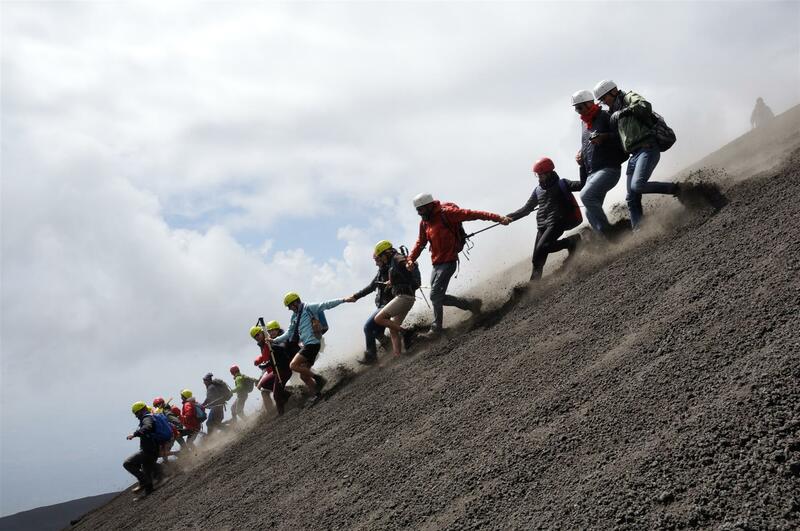 Difficulty: Medium/Hard. 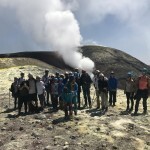 Groups 8 – 20 people per guide. 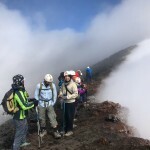 After this excursion, guests are always very happy, but tired. 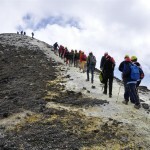 It would be better to face this exacting trekking the same day of arrival, if possible, or stay two nights in the hotel. 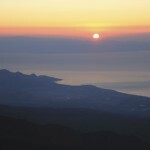 You can have so chance to rest in hotel and its SPA. 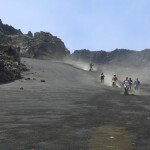 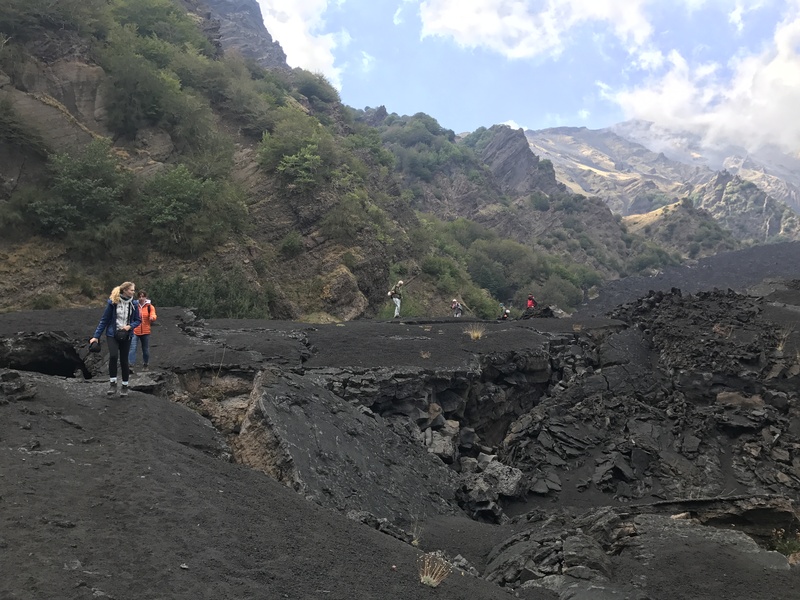 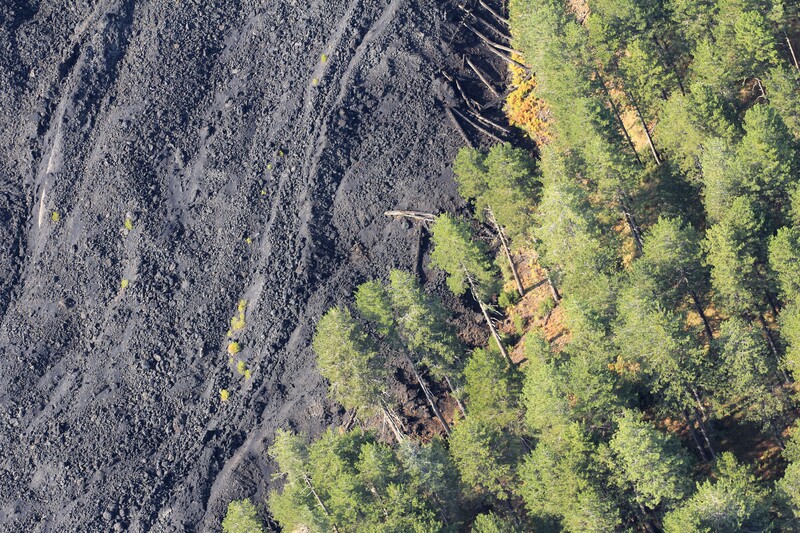 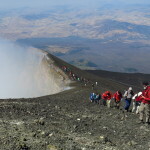 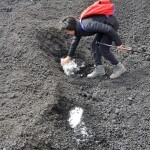 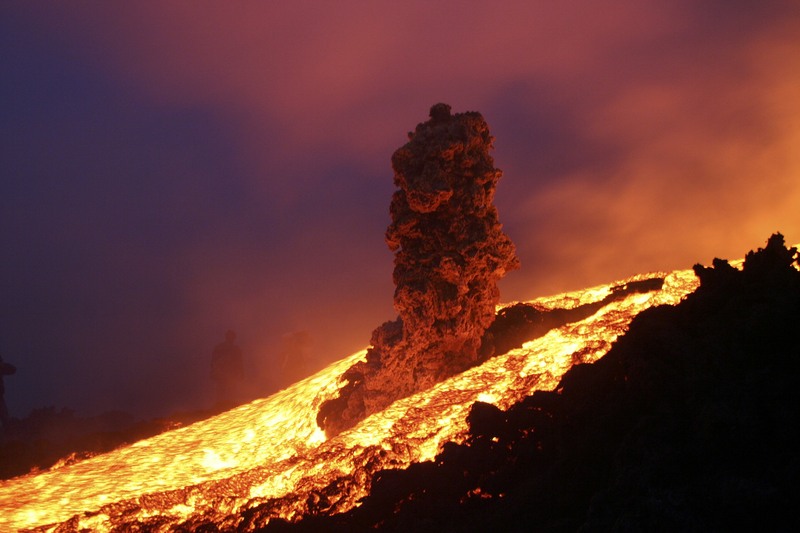 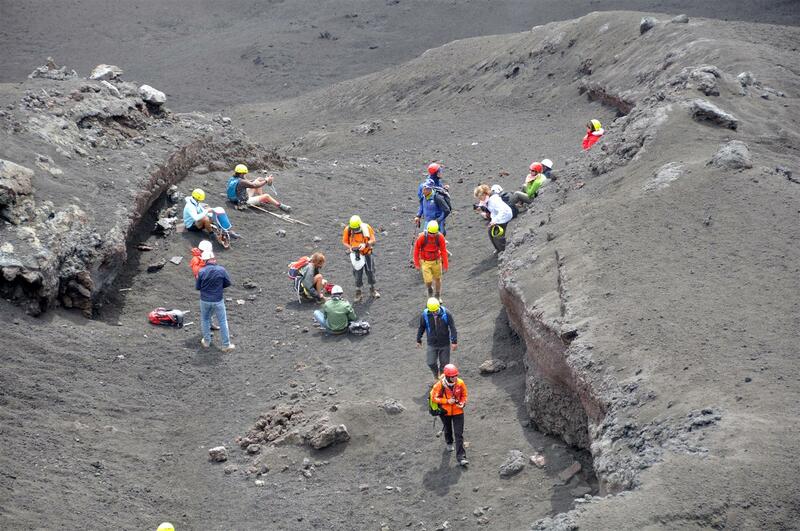 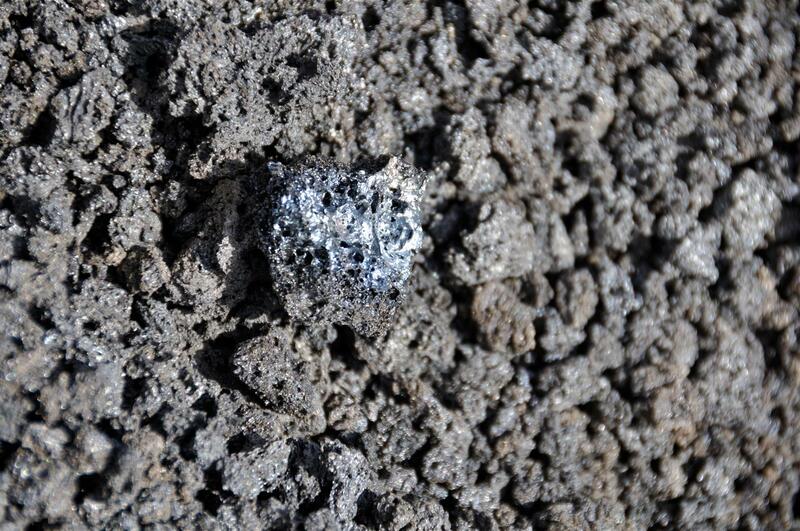 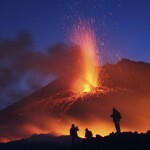 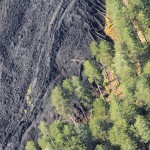 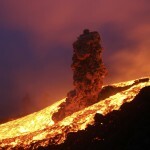 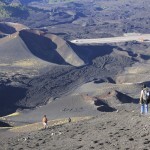 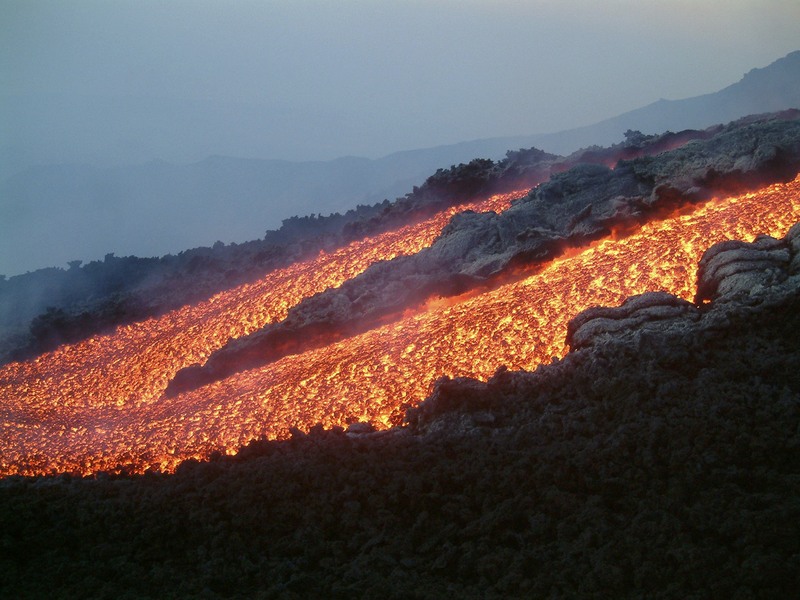 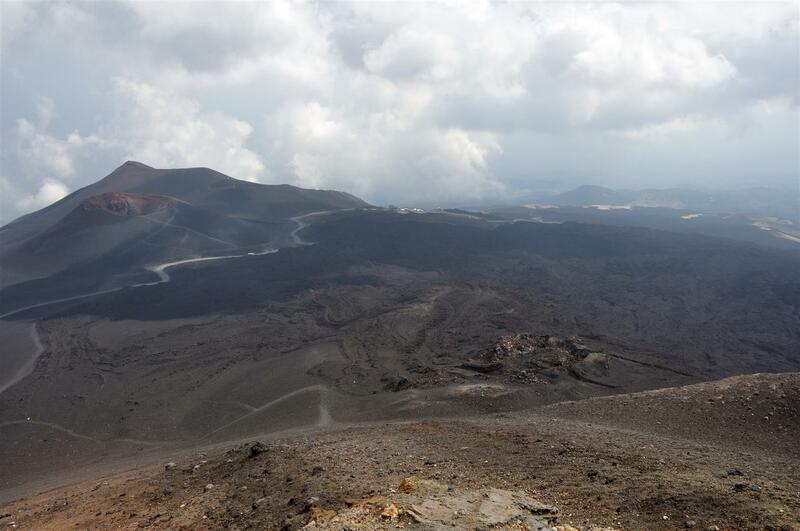 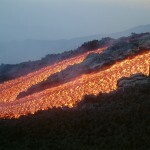 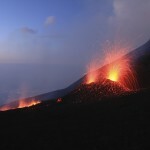 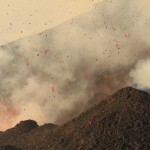 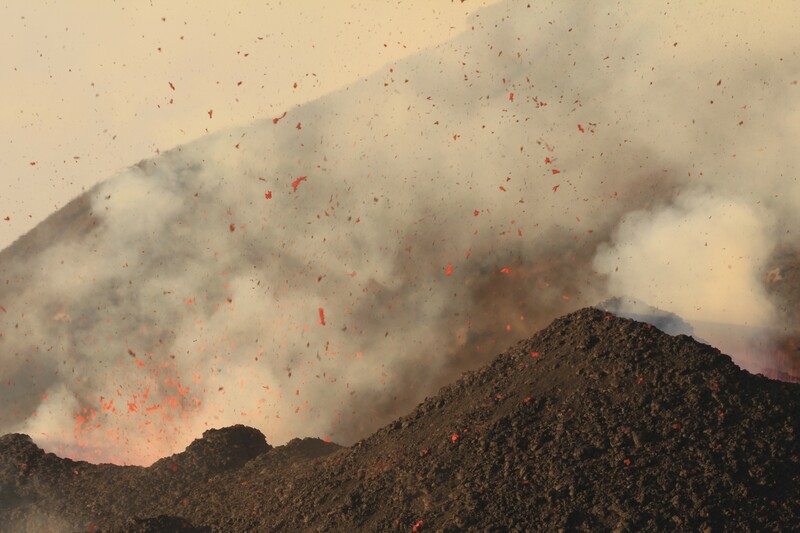 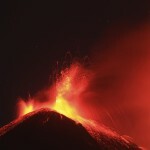 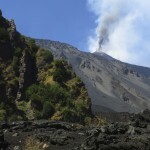 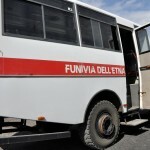 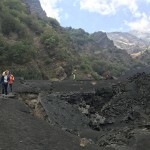 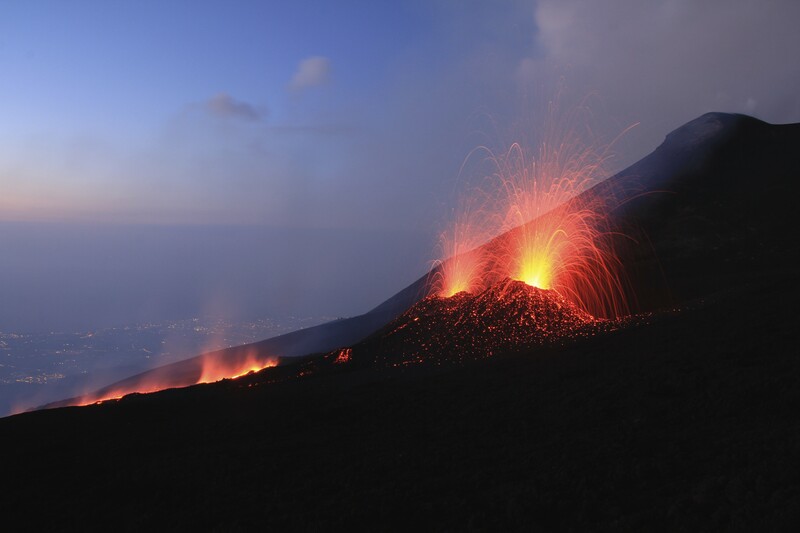 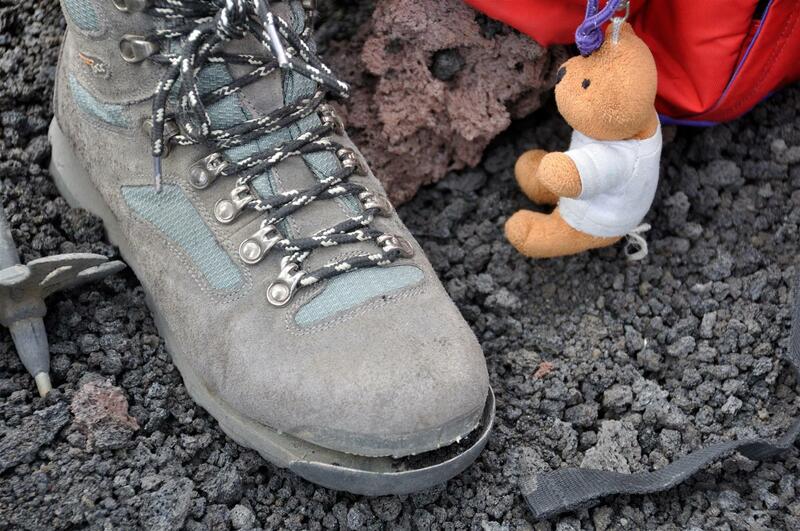 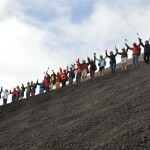 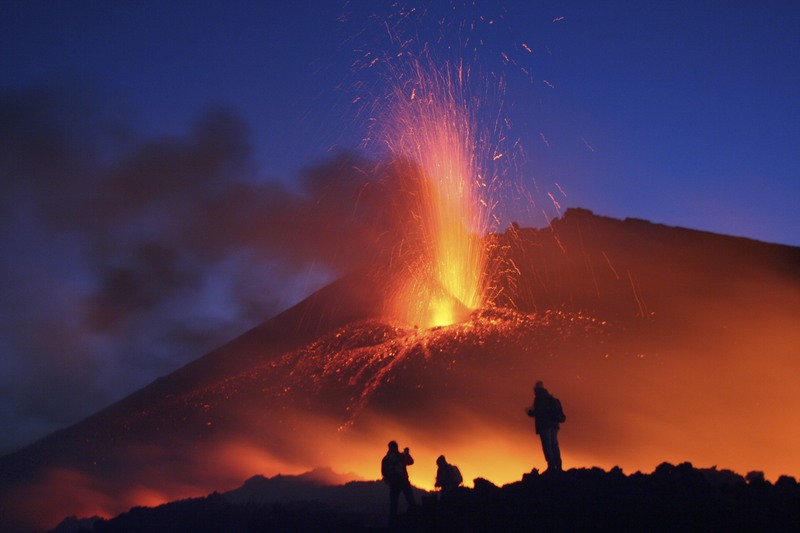 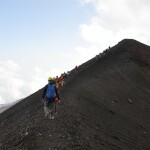 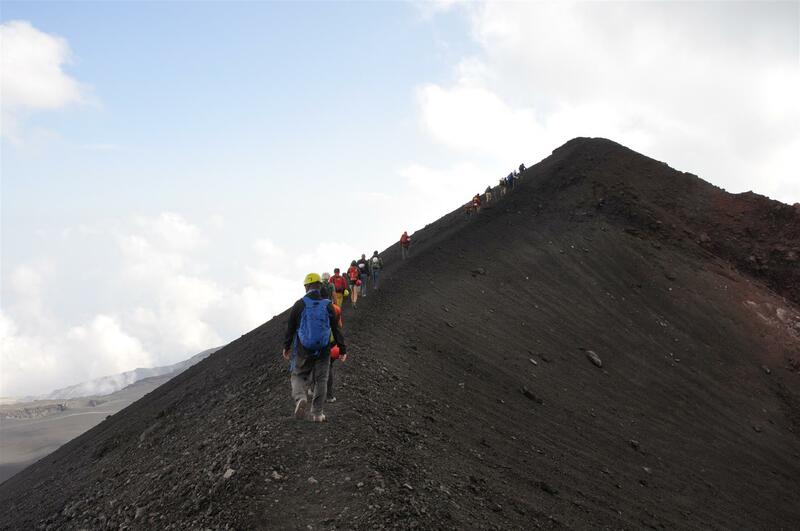 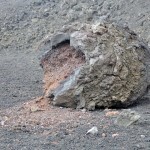 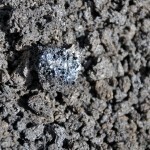 It is uncomfortable to leave Etna to other destinations tired and dirty from ash and sweat. 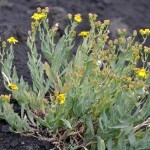 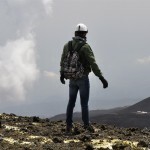 NOTE: Trekking equipment (boots, jacket, sweater, etc. 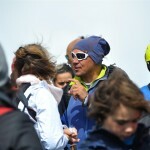 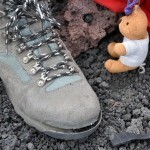 ); in case you do not have any, guide will provide boots, socks, jackets, sticks and helmets (included in the price). 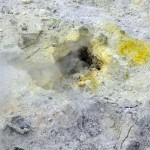 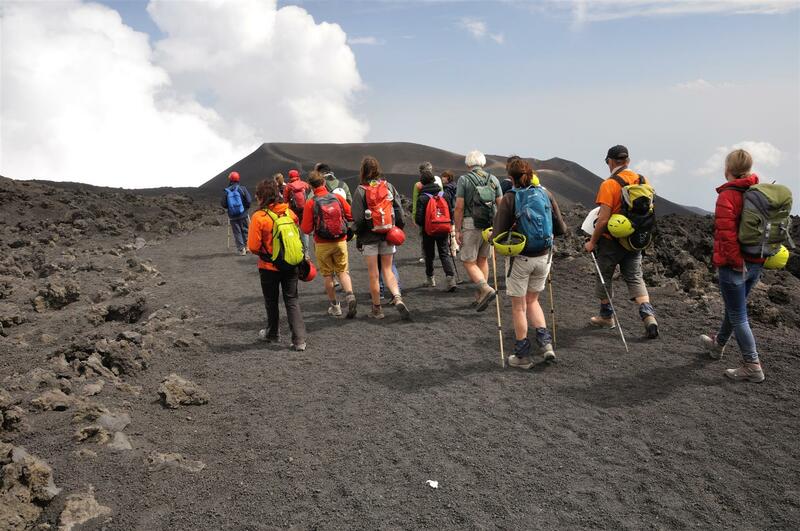 Excursion is not allowed to people with heart problems, asthma and particular pathologies. 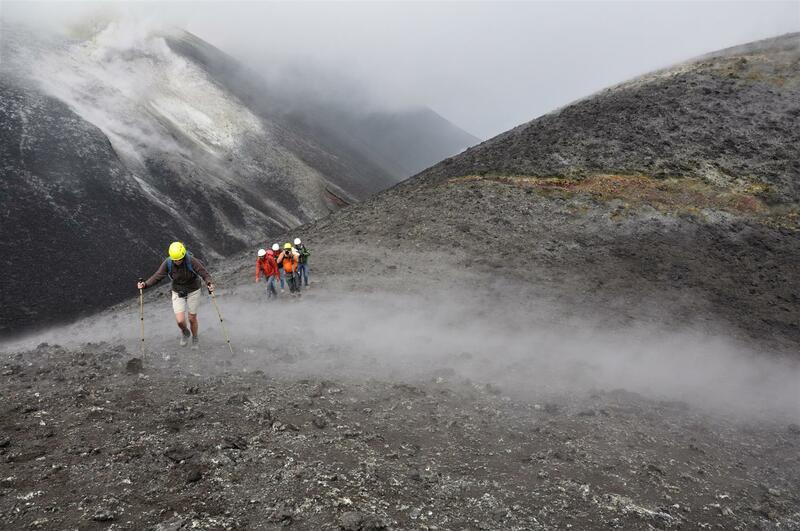 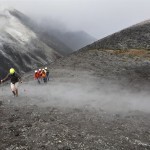 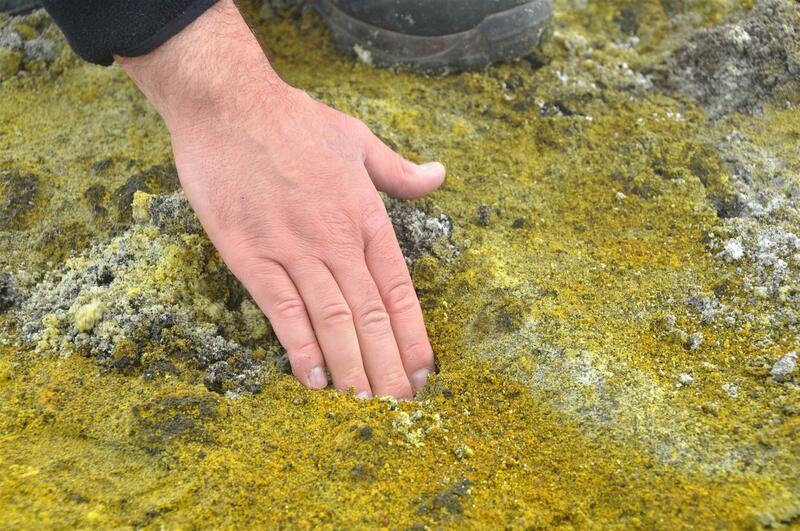 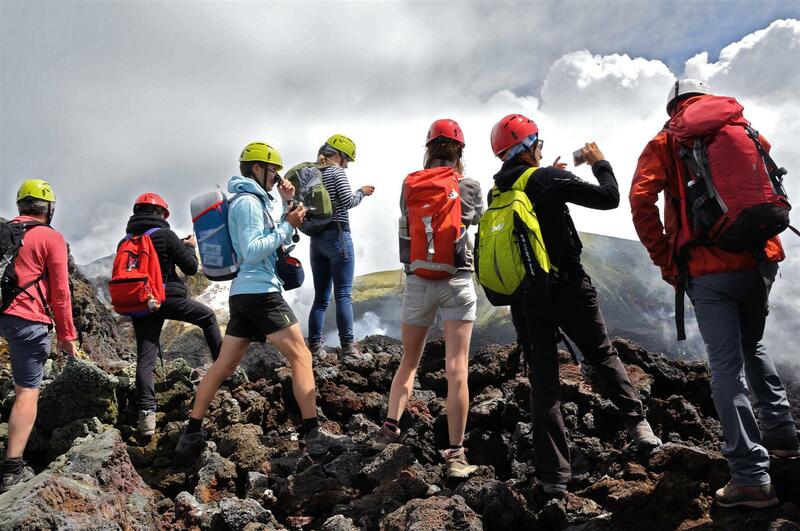 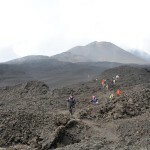 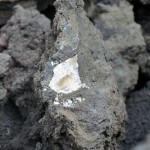 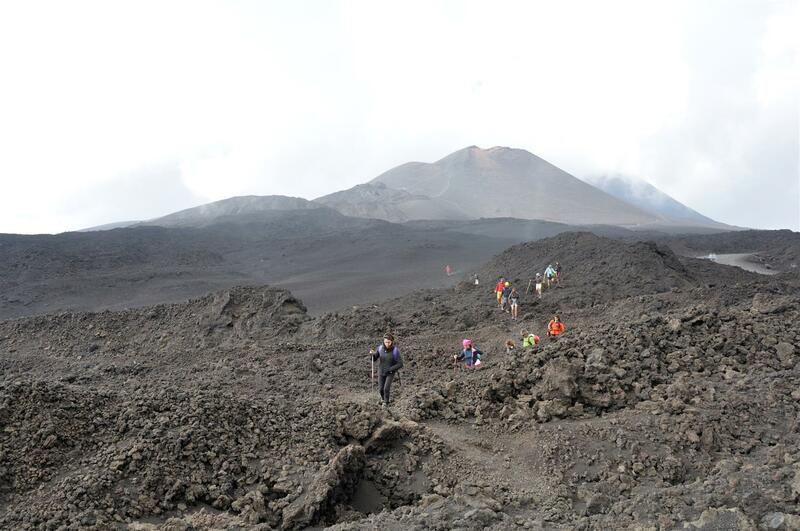 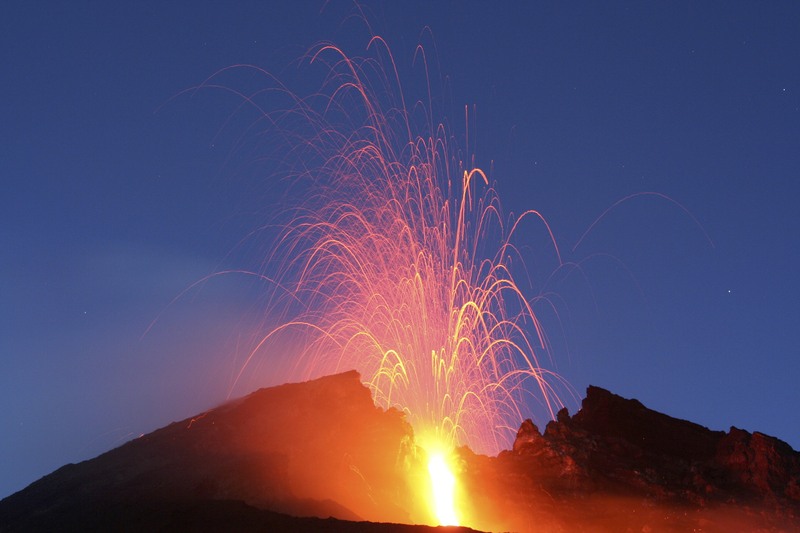 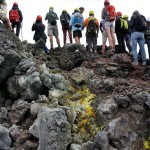 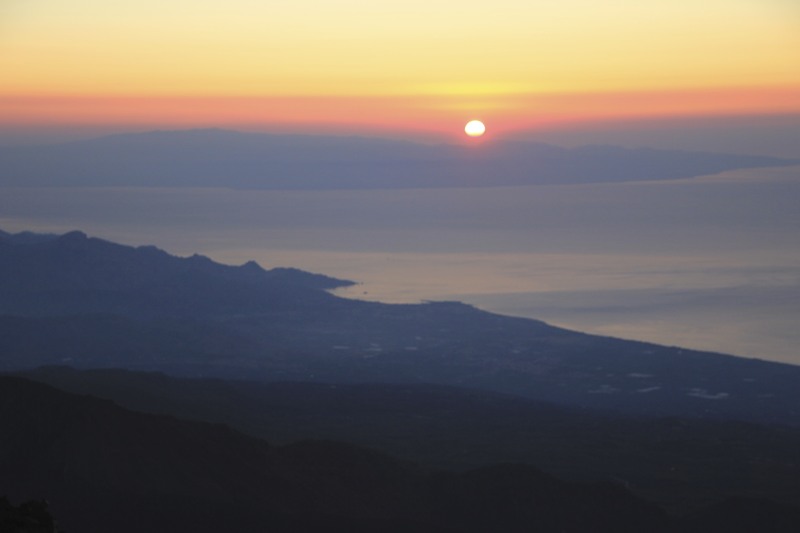 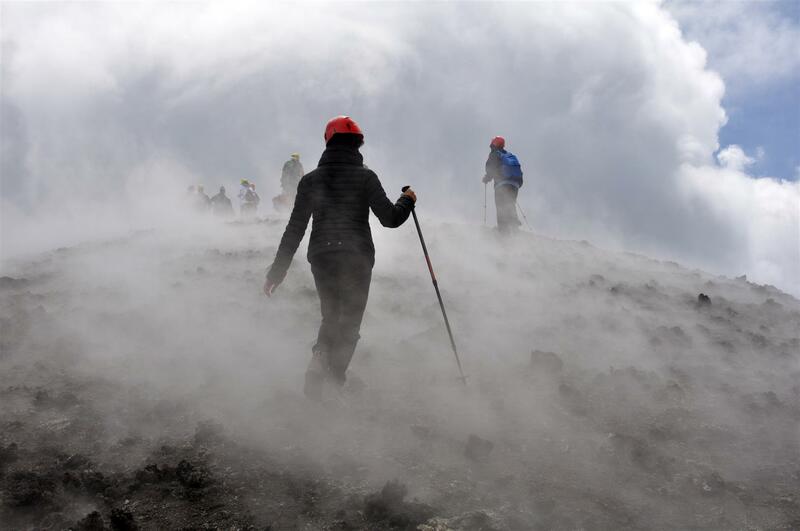 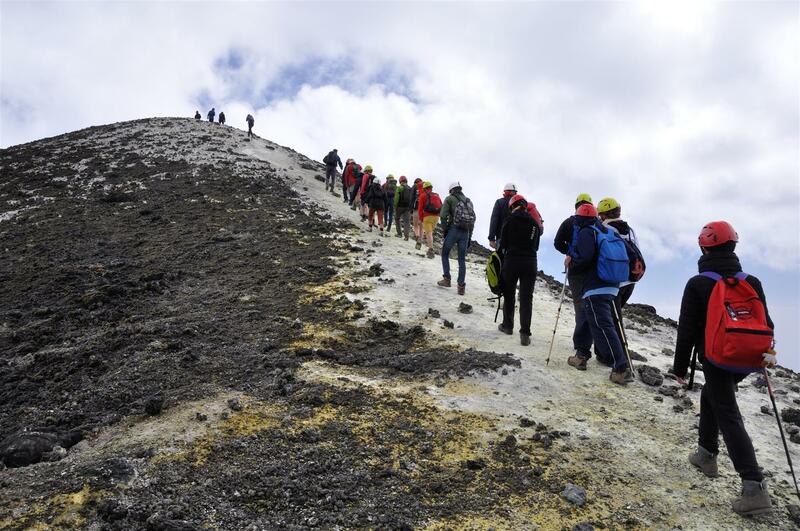 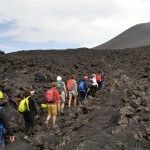 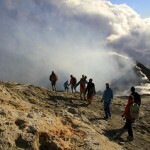 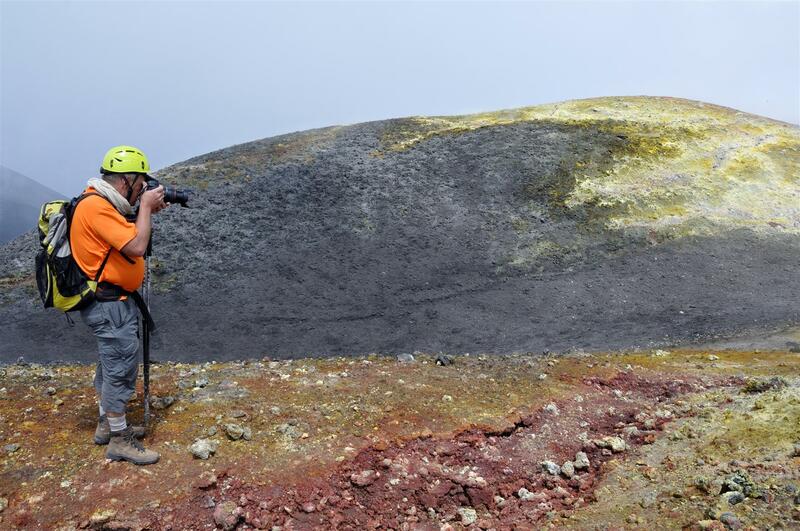 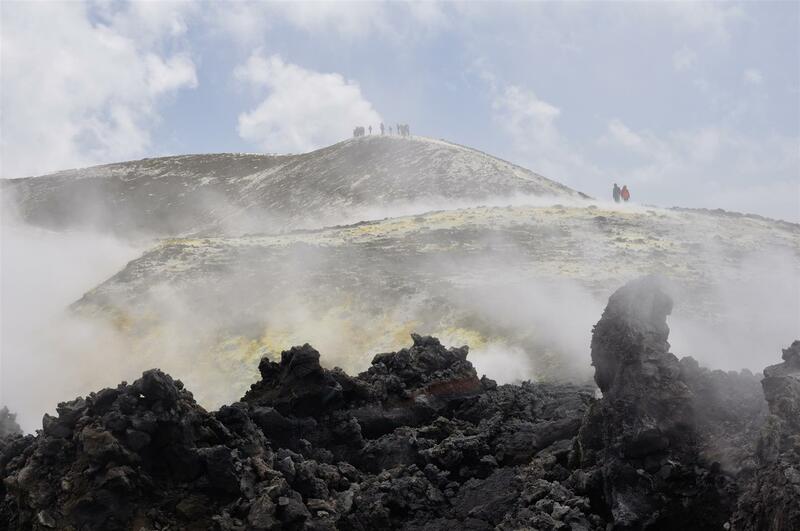 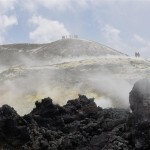 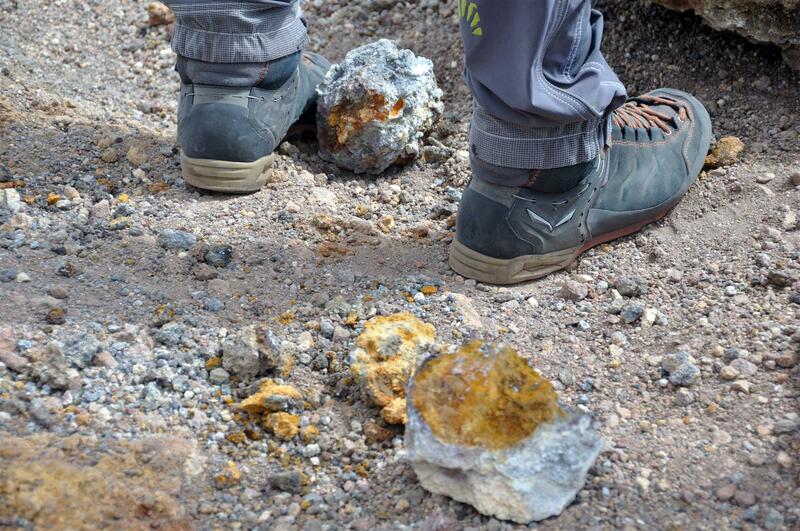 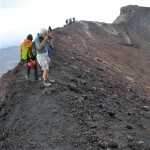 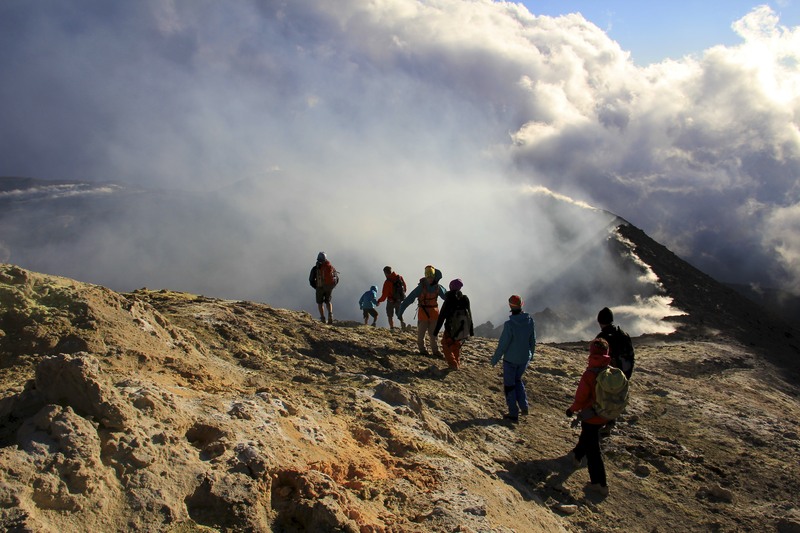 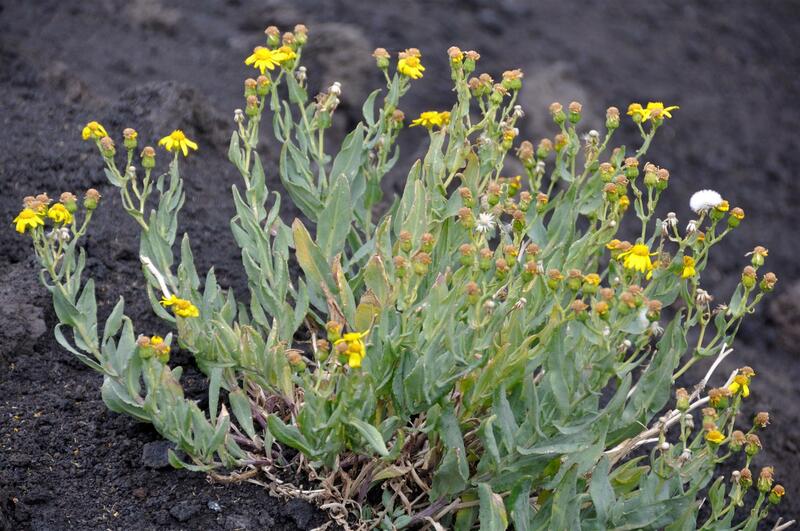 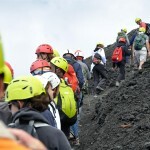 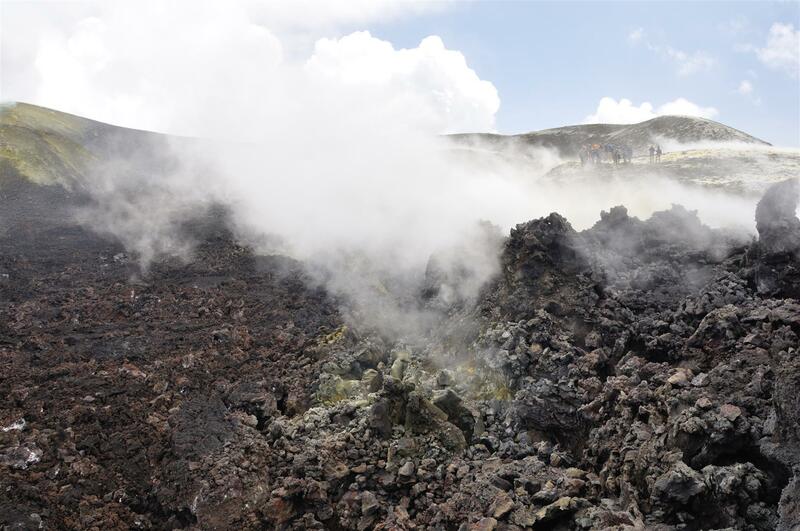 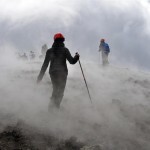 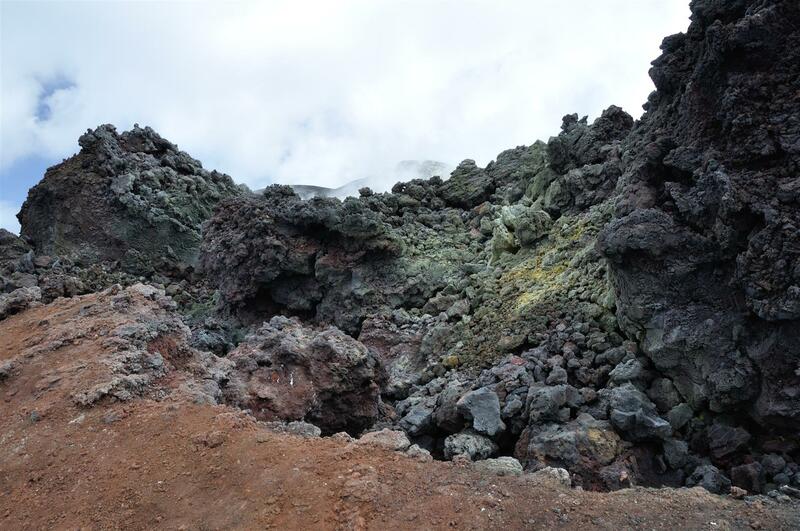 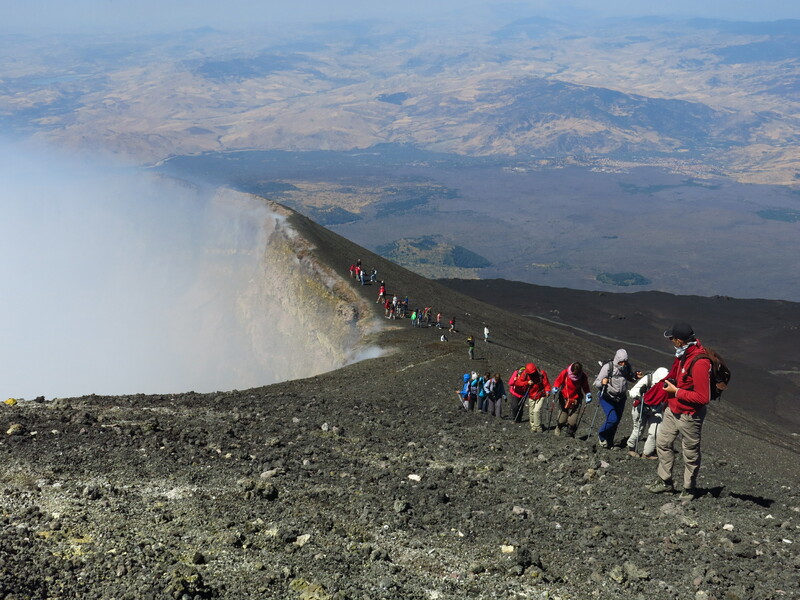 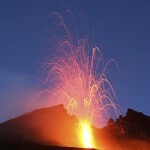 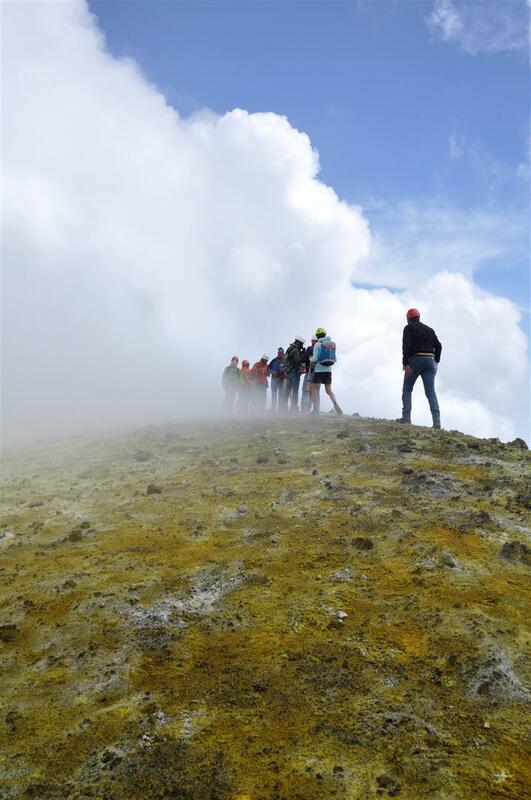 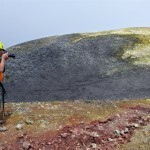 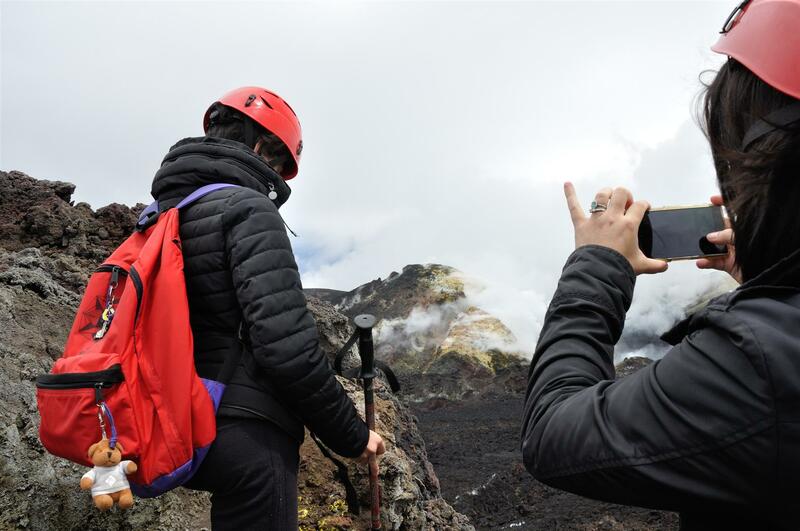 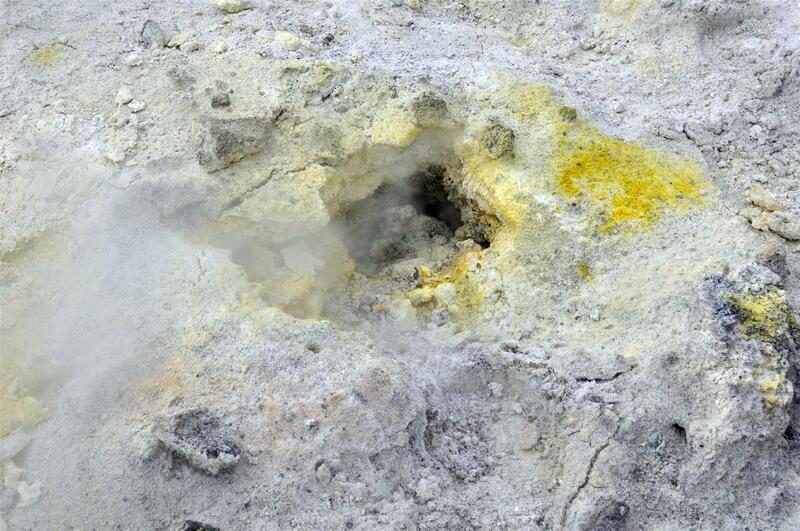 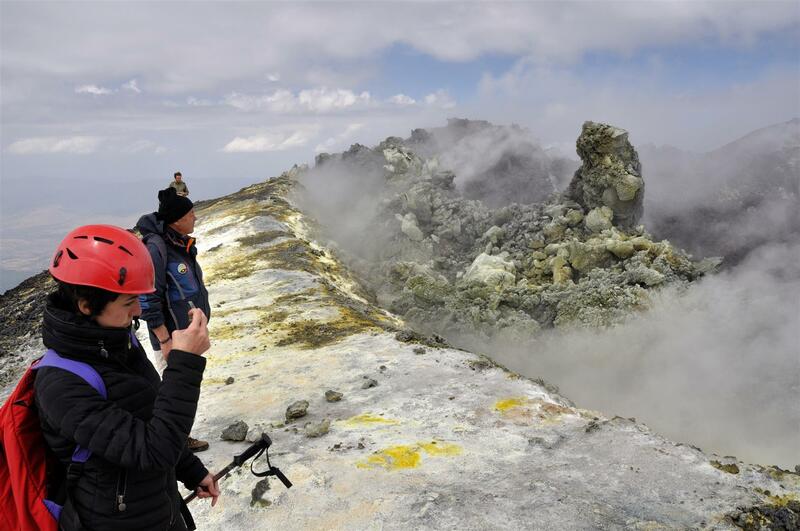 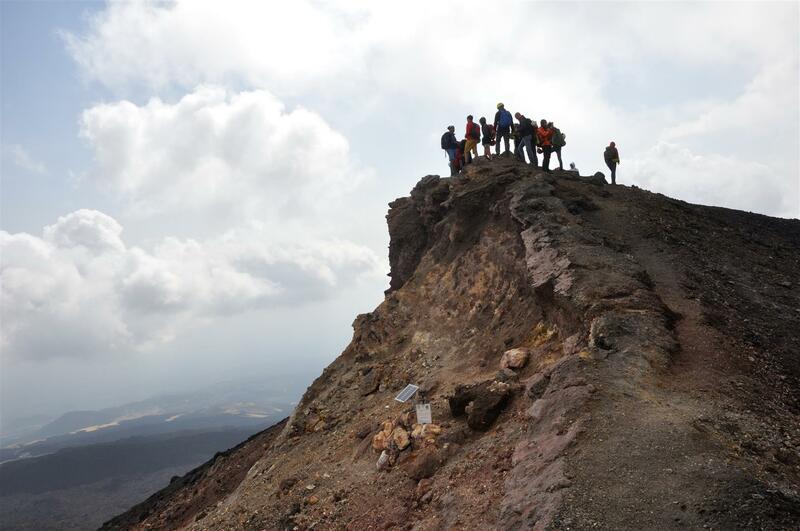 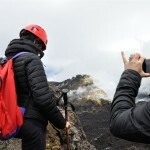 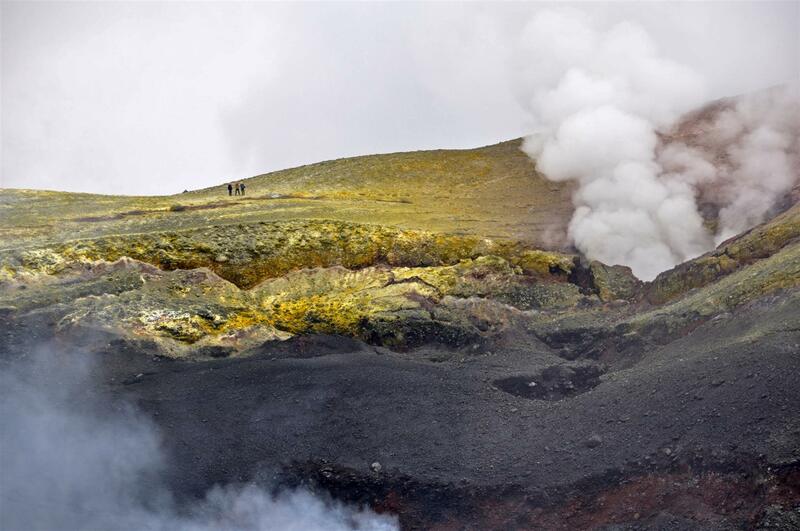 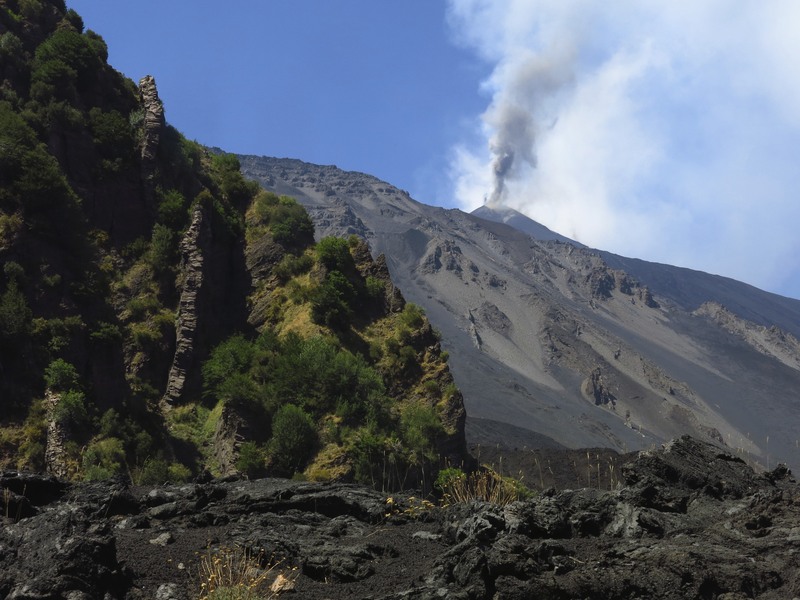 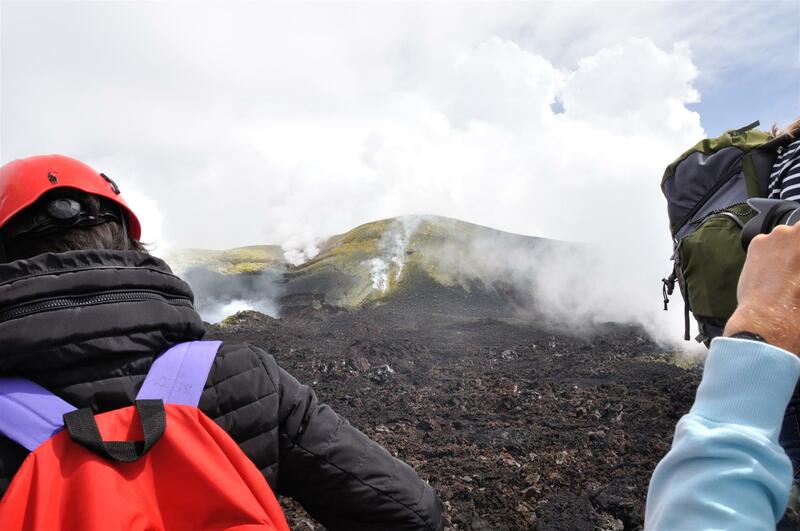 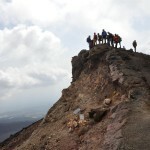 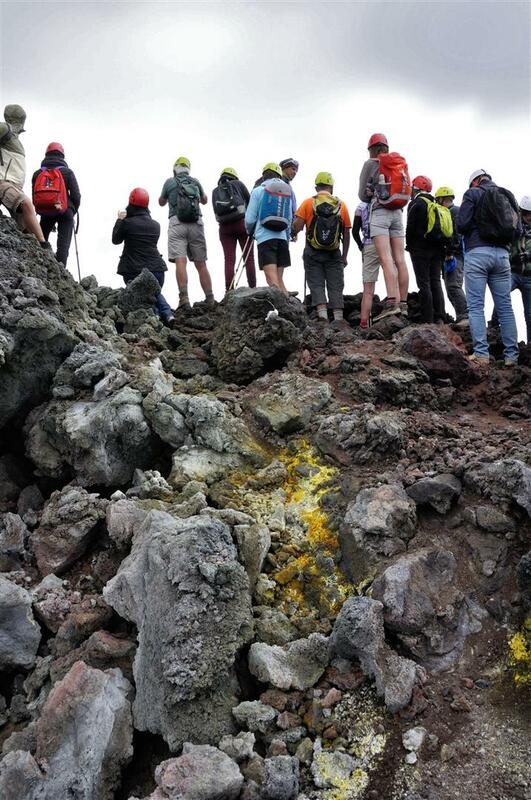 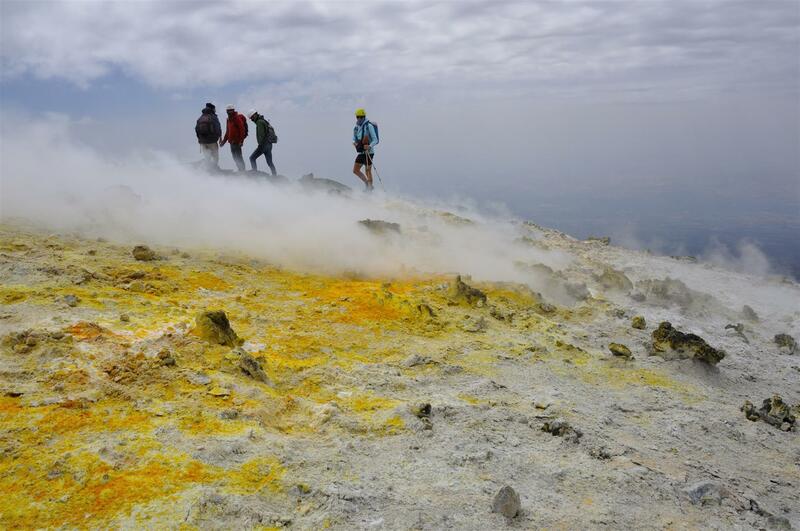 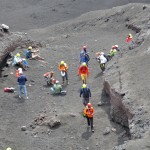 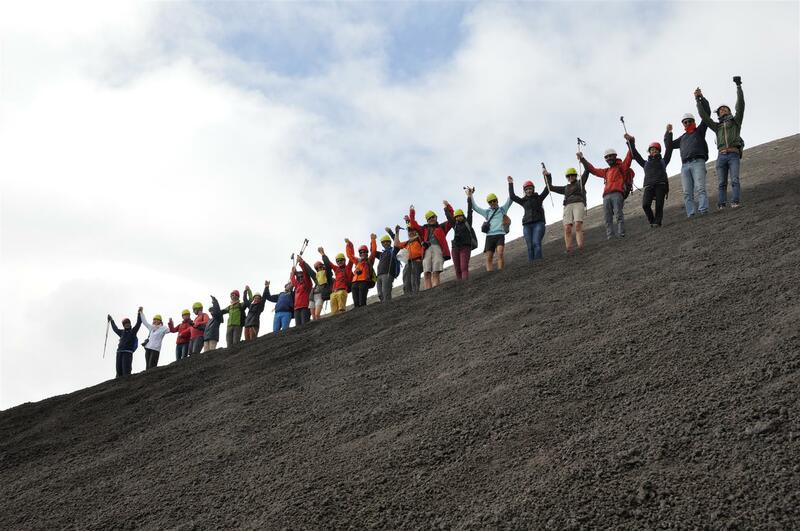 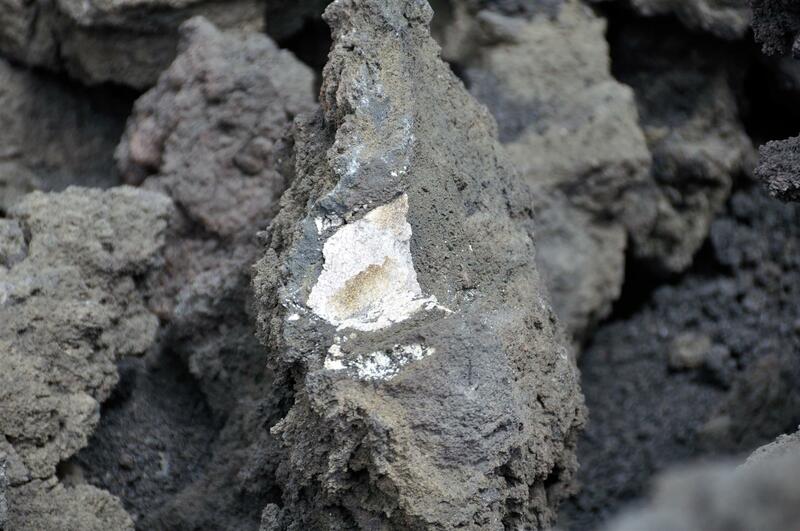 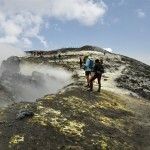 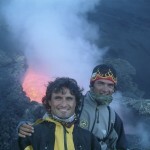 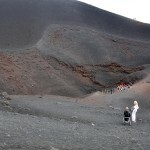 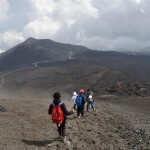 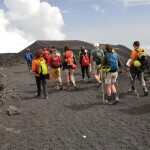 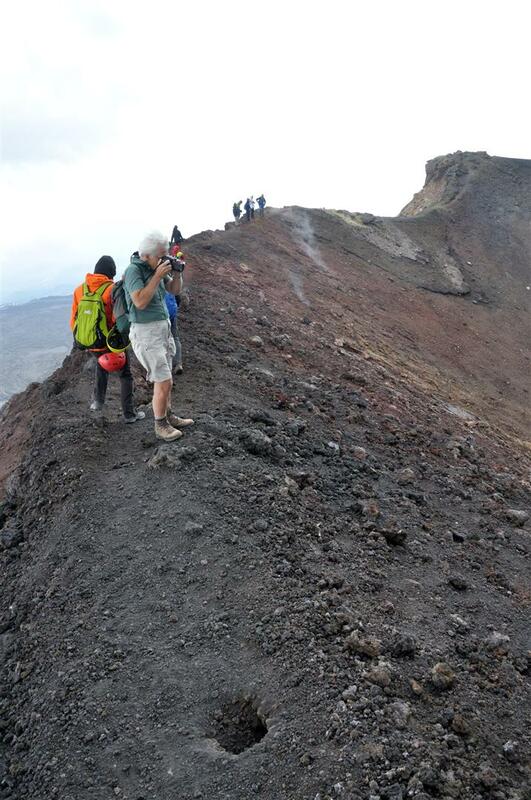 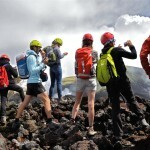 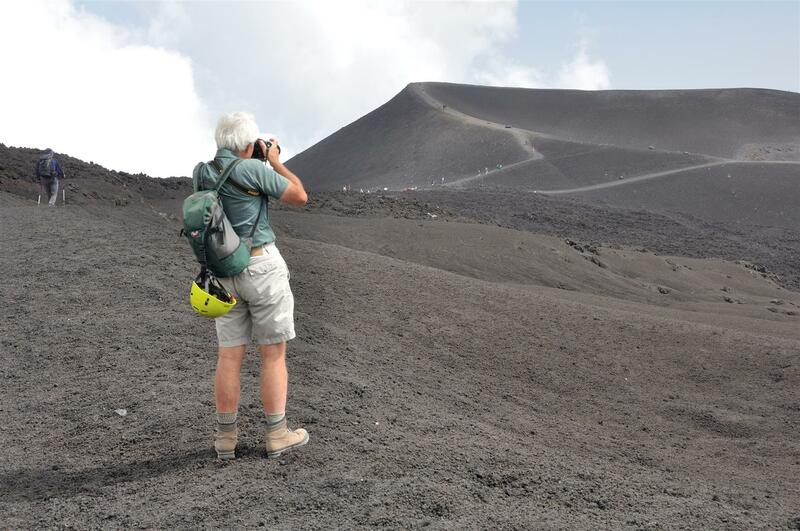 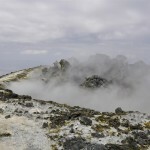 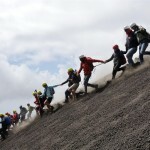 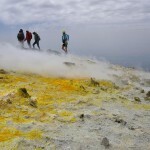 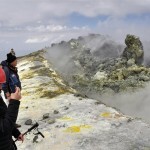 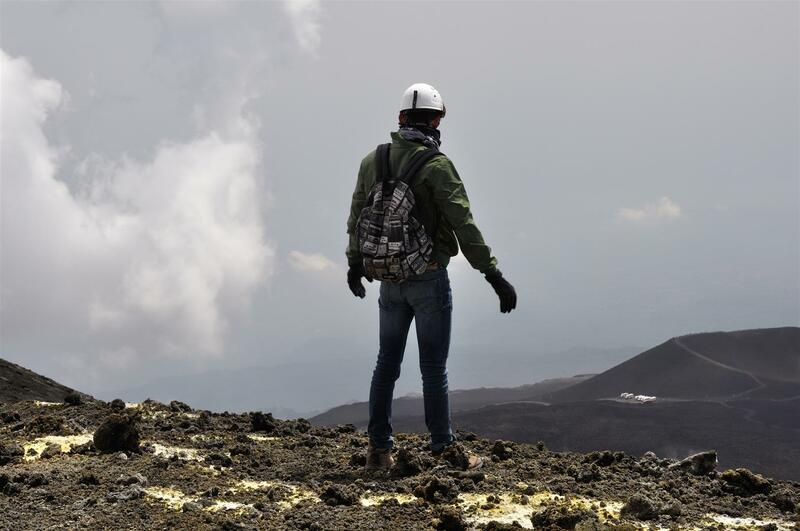 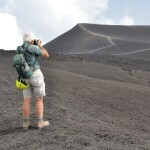 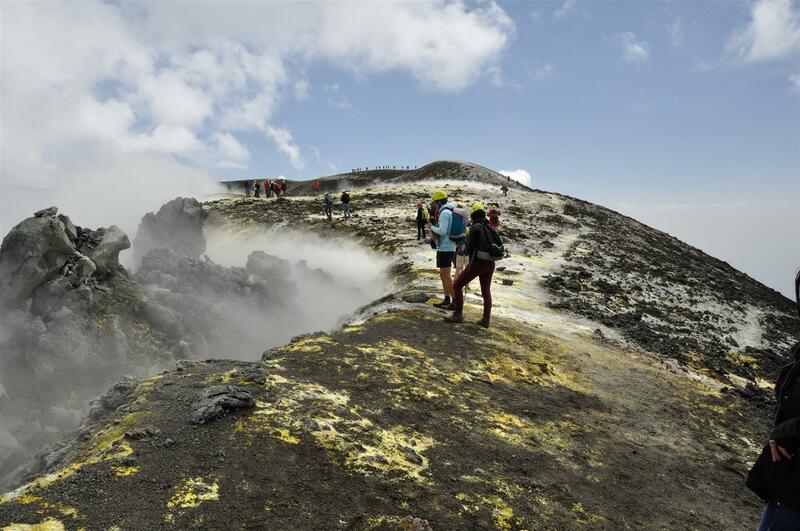 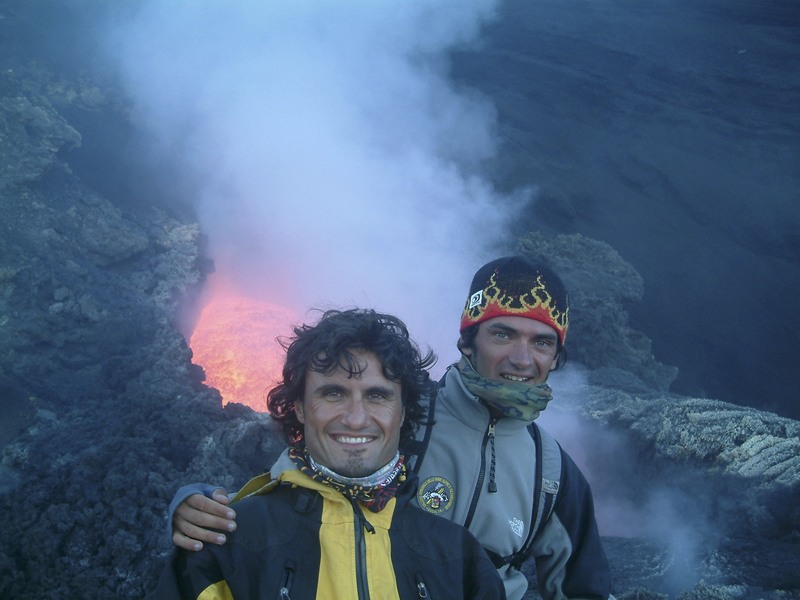 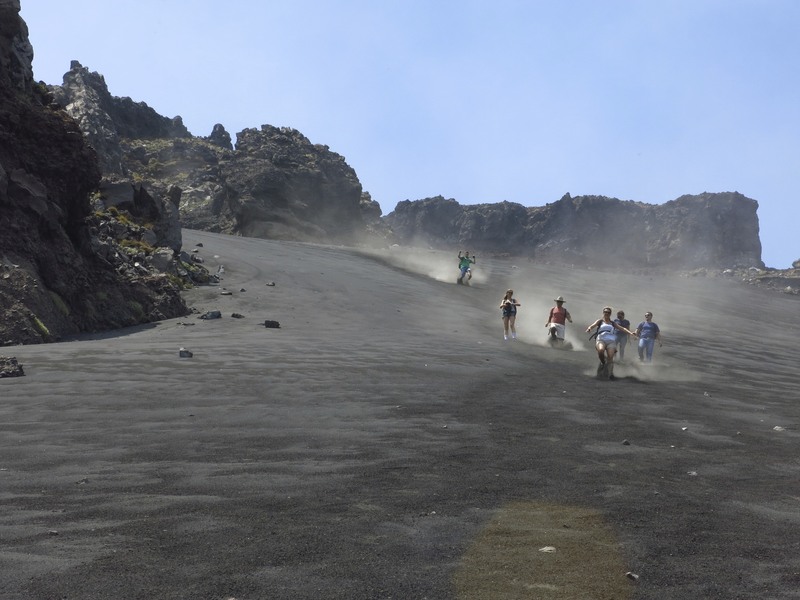 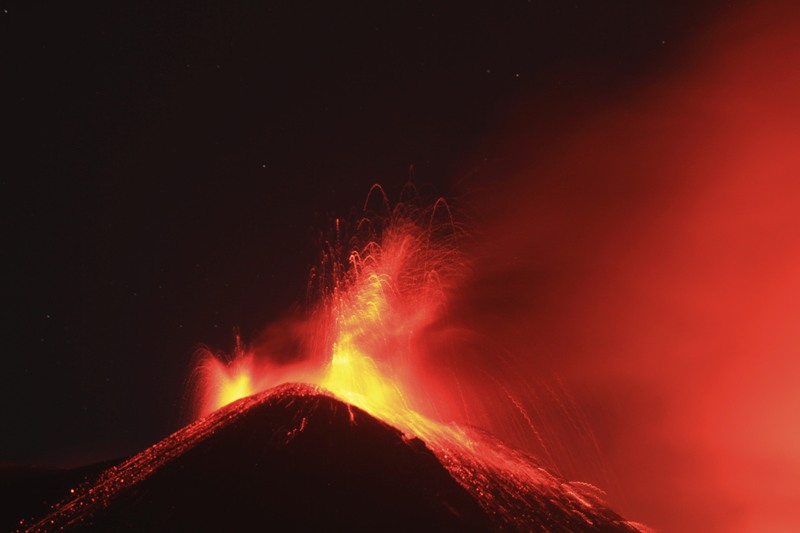 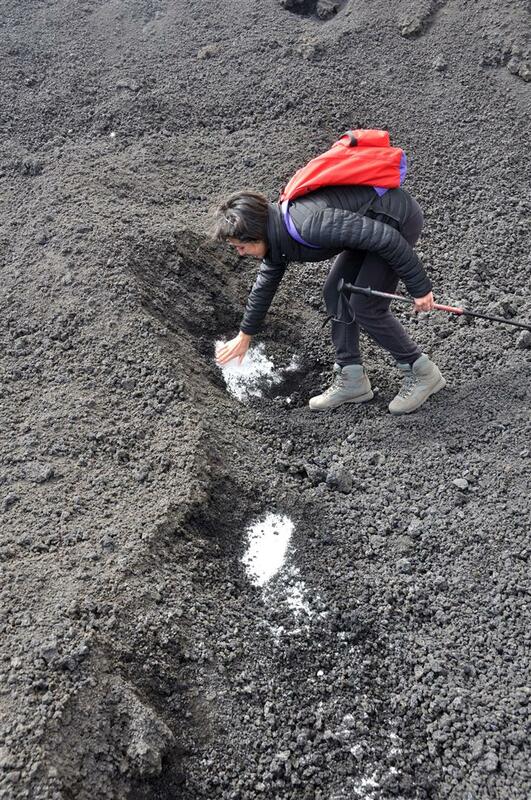 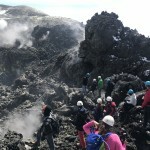 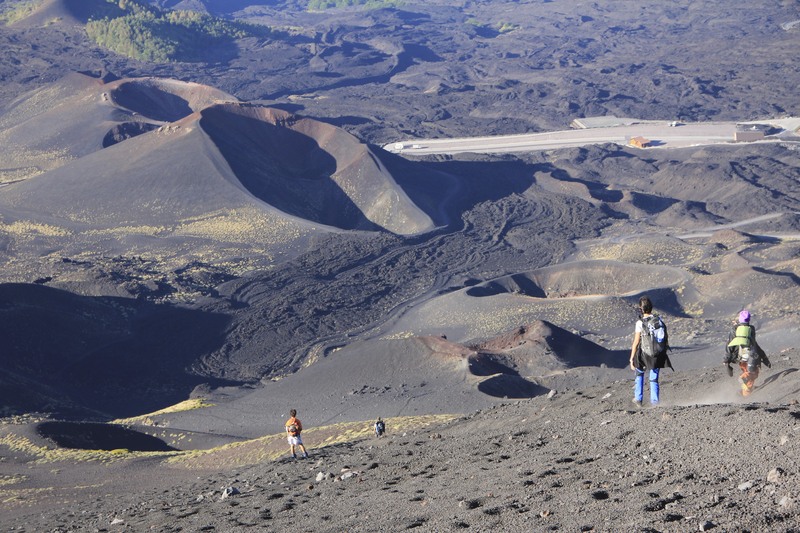 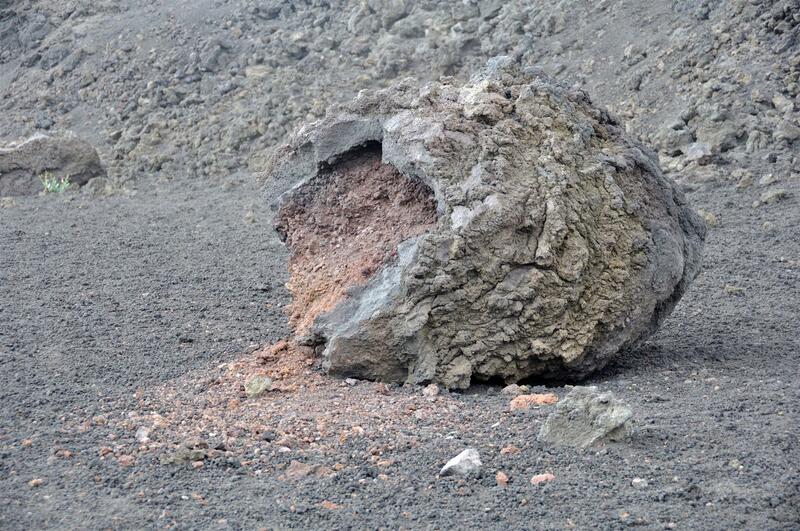 Excursion can be modified on guide discretion according on weather and volcanic conditions. 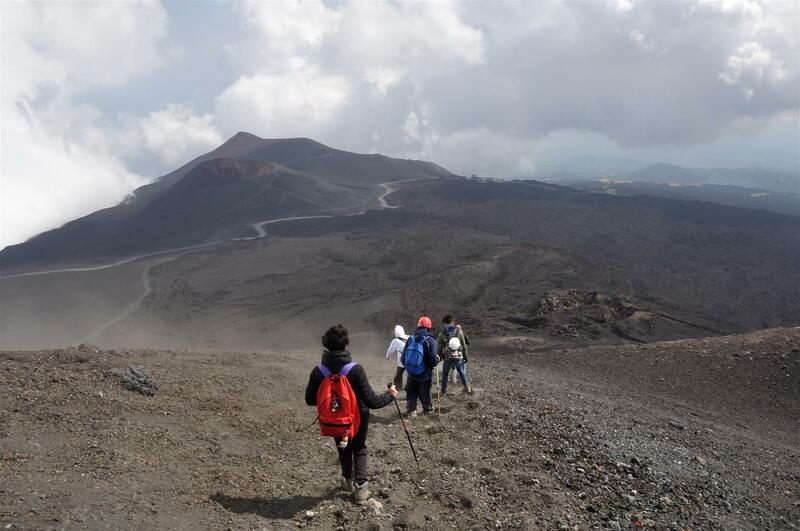 Excursion is not an hotel service. 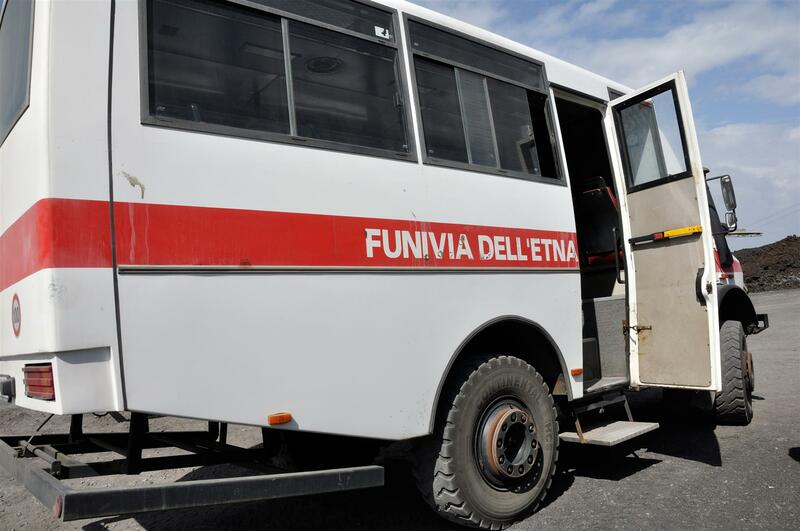 We accept no responsabilities.